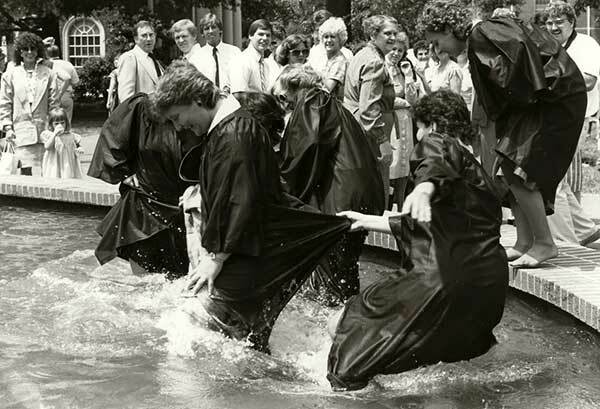 Since its founding in 1889, Elon University has established a history steeped in traditions—from the annual Commencement Under the Oaks to the weekly College Coffee gatherings. The purpose of this site is to introduce visitors to this rich history and traditions and offer alumni an opportunity to reminisce and relive fond Elon memories while picking up a few new historical facts along the way. See all the entries at once or browse the different categories at the top. Have a story or memory to share? Fill out the comments box that appears when you click on a category. Long live Elon! Your comment was successfully posted and is awaiting moderation. Leo M. Lambert became Elon's eighth president in January 1999. Immediately, he focused on completing the Elon Vision strategic plan, which included the construction of Rhodes Stadium and the opening of Carol Grotnes Belk Library. Today, Lambert's work focuses on an ambitious new strategic plan that aims to place Elon among the nation's best small, selective, private universities. Elon's academic climate has been strengthened by endowed programs such as the Kenan Honors Fellowships, Baird Pulitzer Prize Lecture Series and Isabella Cannon Distinguished Visiting Professorship in Leadership. Lambert has led efforts to more than double expenditures on library acquisitions, increase faculty sabbatical opportunities and improve Elon's competitiveness in NCAA Division I athletics by joining the Southern Conference. He has been deeply committed to further strengthening Elon's international programs, primarily through the Isabella Cannon International Centre and the Isabella Cannon International Studies Pavilion and his leadership in national efforts such as Campus Compact and Project Pericles. During his tenure, the Martha and Spencer Love School of Business has attained accreditation by the AACSB International-Association to Advance Collegiate Schools of Business and the School of Communications earned accreditation from the Accrediting Council on Education in Journalism and Mass Communications. He also oversaw the completion of the Ernest A. Koury Sr. Business Center and the establishment of Elon University School of Law in Greensboro, N.C., both in fall 2006. J. Fred Young has spent a lifetime striving for educational excellence in Alamance County. A native of Burnsville, N.C., Young attended Mars Hill College, Wake Forest University, the University of North Carolina at Chapel Hill and Columbia University. 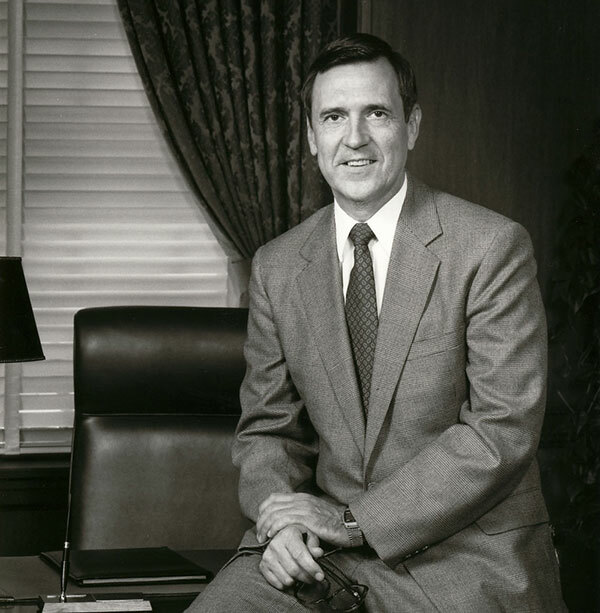 In 1973, Young became the seventh president of Elon College and served until 1998, making him one of the longest-serving presidents in Elon's history. 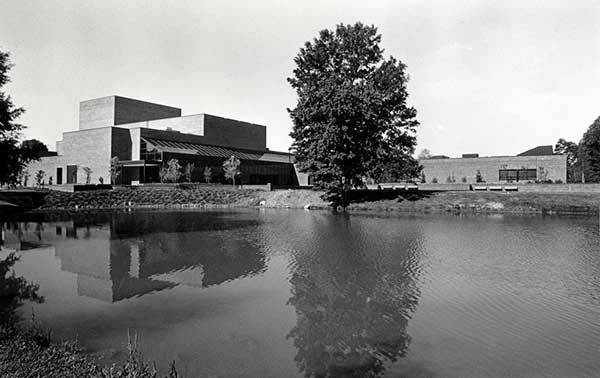 During his tenure, the college more than doubled its enrollment (it exceeded 2000 in 1973) and became one of the premier undergraduate institutions on the East Coast. New academic offerings included master's programs in business administration, education and physical therapy; a new general studies program; and new majors including communications, computer systems, sports medicine and leisure and sport management. 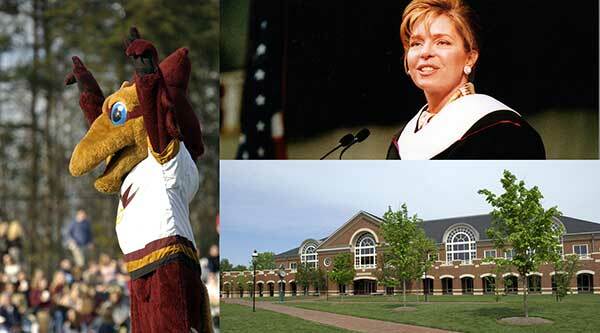 The Elon campus expanded from about 145 acres to more than 500 acres during Young's presidency. New construction and renovations included the Center for the Arts; the Koury Center for athletics and physical education; Moseley Center for campus activities; Story Center, Jordan Center and East Campus residence hall complexes; and the McMichael Science Center. 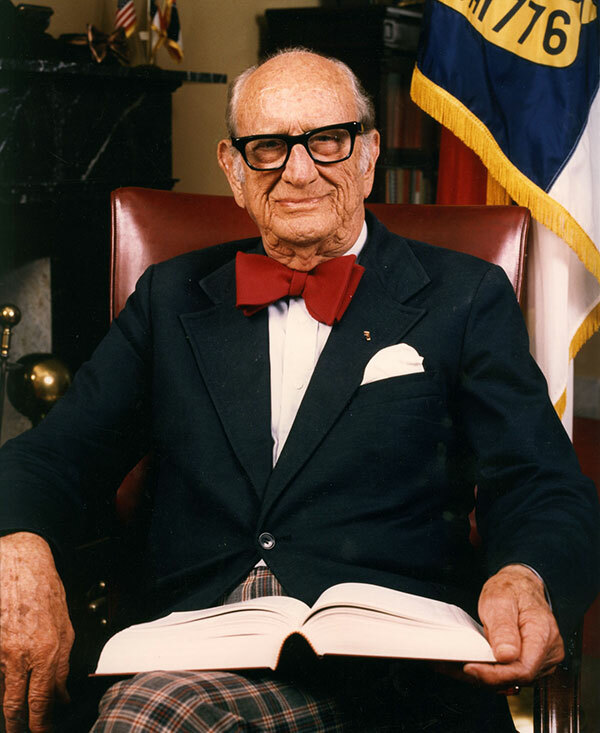 Young presided over the groundbreaking for Carol Grotnes Belk Library just before he stepped down as president, and he also led initial fundraising for Rhodes Stadium. A native of Alamance County, J. Earl Danieley has dedicated more than half a century to the growth and improvement of Elon and its surrounding community. A 1946 Elon graduate, he received graduate degrees in organic chemistry from the University of North Carolina at Chapel Hill and Johns Hopkins University. 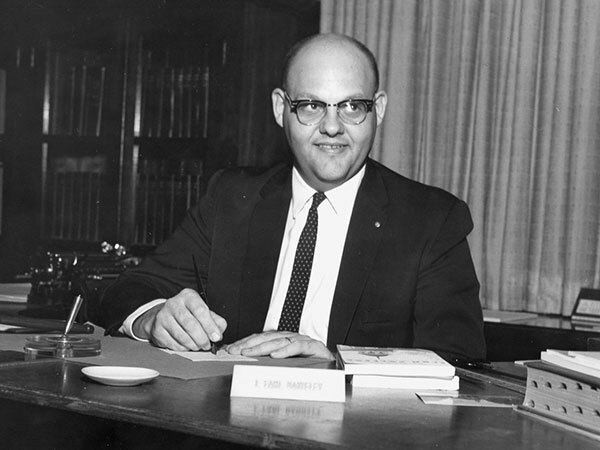 Beginning his career as a chemistry instructor at Elon, Danieley served from 1953 to 1956 as dean of the college before being named president of Elon in 1957. He stepped down in 1973 to dedicate the next years of his life to teaching and has served as the Thomas E. Powell Jr. Professor of Chemistry since 1982. He was elected to the University of North Carolina Board of Governors in 1983 and served in that capacity for 12 years. 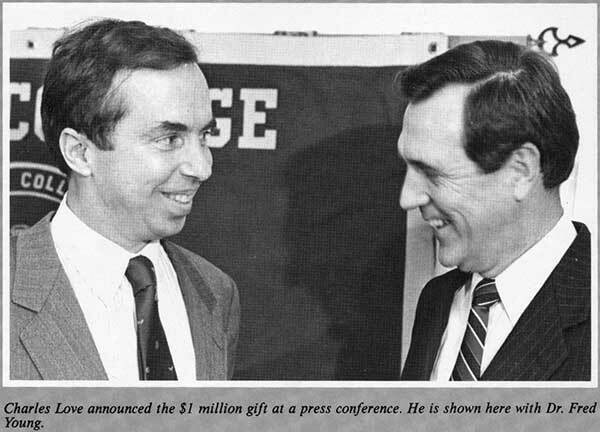 In 1987, Danieley agreed to reduce his teaching hours and picked up the additional role of director of planned giving for Elon, a position he held until 1992. In that year, he received the title of "president emeritus." A 1910 Elon College graduate, L.E. 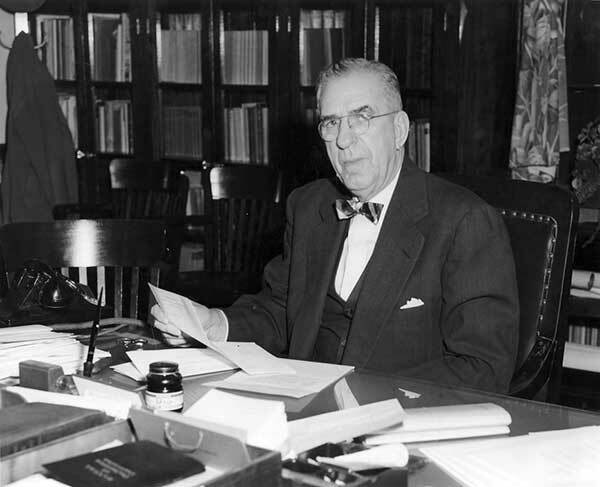 Smith was the longest-serving and among the most influential presidents in the institution's history (1931-57). His dedication to Elon and his business-minded leadership saved the college from financial collapse. 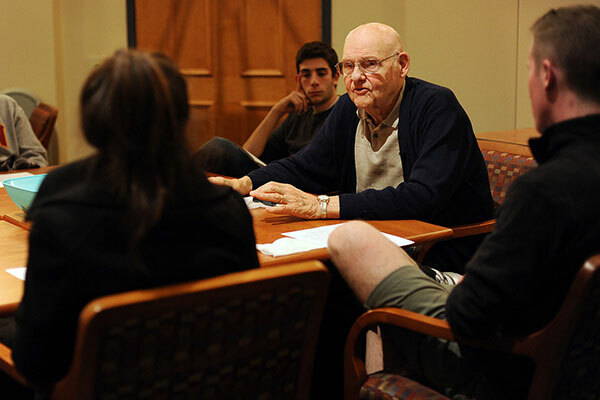 Smith carried Elon College through the Great Depression, three small campus fires, World War II and the Korean Conflict. He was the 1950 recipient of the Outstanding Alumnus Award and oversaw the construction of an on-campus gymnasium that year. Throughout the 1950s, he continued to improve Elon's programs, opening a night school, building new residence halls and growing enrollment. Before his retirement in 1957, Smith became the first president in Elon history to be honored with the title "president emeritus." 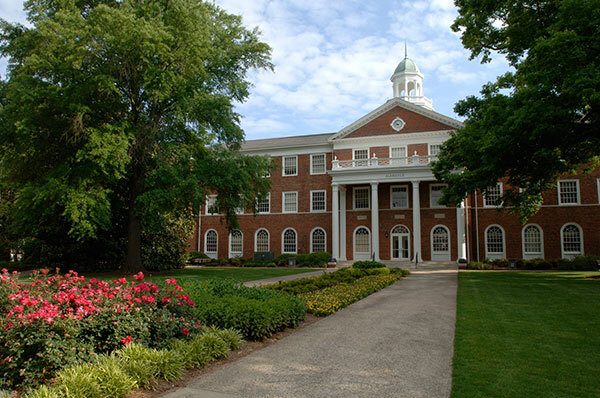 William Allen Harper (1911-31) was tasked with rebuilding Elon College after the devastating 1923 fire. His vision led to the construction of many of the key buildings still used at Elon today. Harper was born in Berkeley, Va., in 1880. He graduated from Elon College in 1899, earned a master's degree from Yale University in 1905 and subsequently began teaching Latin and religion at Elon. In 1908, he was elected dean of the college and served in that position until he became Elon's fourth president in 1911. Harper saw Elon through World War I, a campus-wide Spanish influenza outbreak in 1918 and the fire of 1923. After the fire, Harper and the board of trustees embarked on an expansive, long-term building plan for the college. 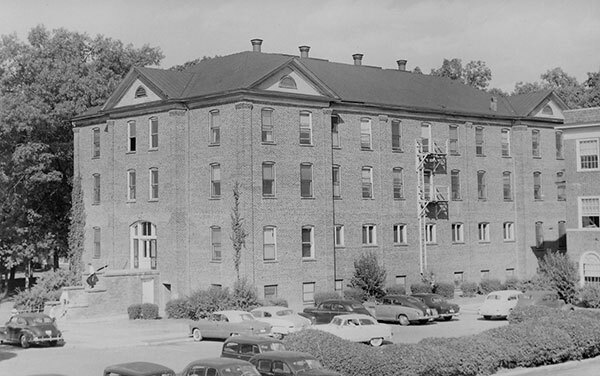 The Mooney Christian Education Building, Alamance Building, Artelia Roney Duke Science Building, Carlton Building and Whitley Auditorium were all constructed within five years of the fire. 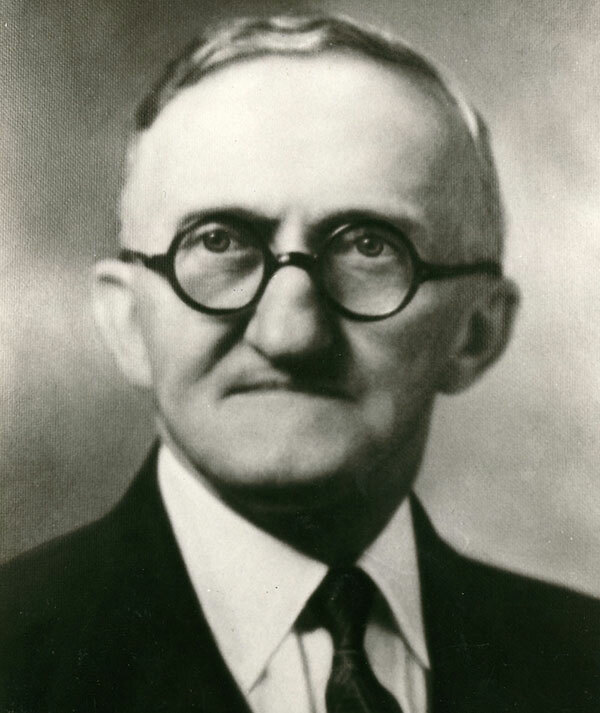 A native of Asheboro, N.C., Emmett L. Moffitt, Elon's third president, oversaw the expansion and modernization of Elon's campus. Prior to his tenure as president, Moffitt served on the Elon faculty as a professor of English from 1890 to 1894. He then served as editor of the Christian Sun until 1900 and worked as secretary-treasurer of the Asheboro Wheelbarrow Company until he was selected as Elon's president. During Moffitt's era (1905-11), Elon's campus was transformed with the addition of electric lights (electric lights were turned on for the first time on New Year's Day 1907), central heat, running water, indoor plumbing, and steam radiators. 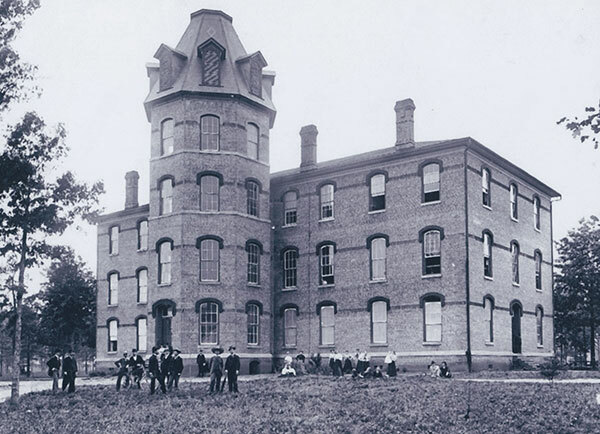 Moffitt also oversaw the construction of West Dormitory. In addition, students enjoyed participation in intercollegiate athletics for the first time in 1906. A native of Alamance County, Rev. 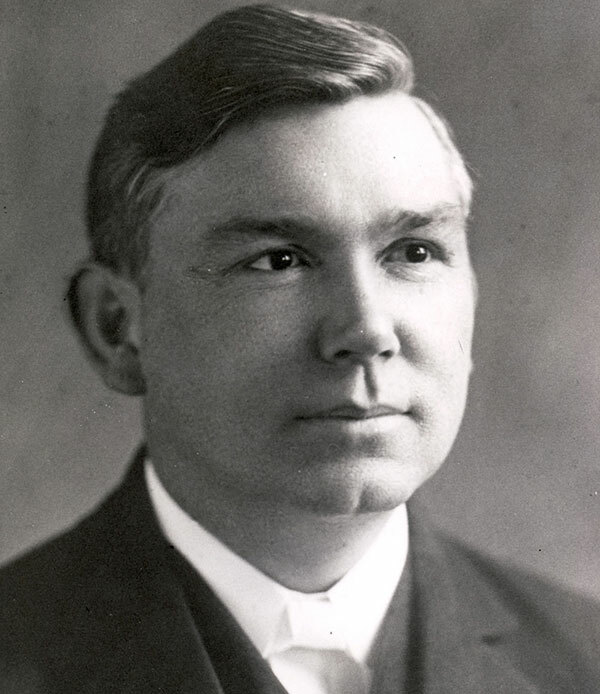 William Wesley Staley (1894-1905) was born in 1849 and studied under his predecessor, former Elon President William S. Long, at Graham High School. He graduated from Trinity College (the predecessor of Duke University) in 1874. 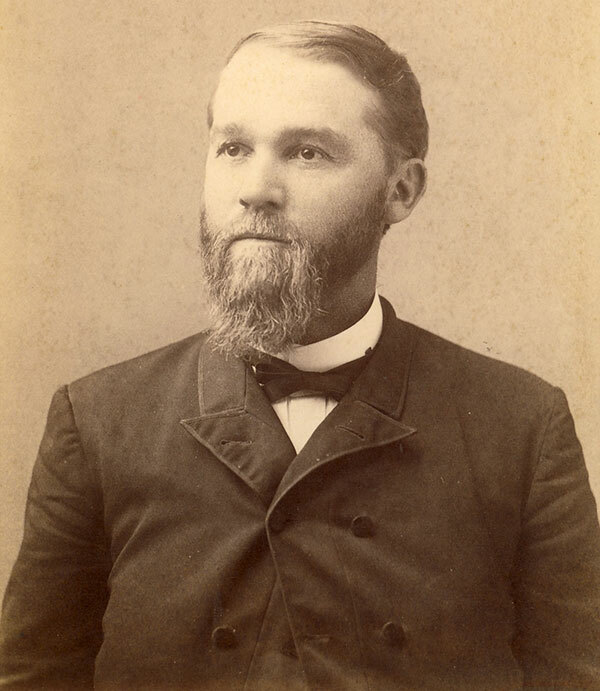 Following graduation, he became a member of the Graham High School faculty and was ordained as a minister in the Christian Church before pursuing graduate studies at the University of Virginia from 1877 to 1878. 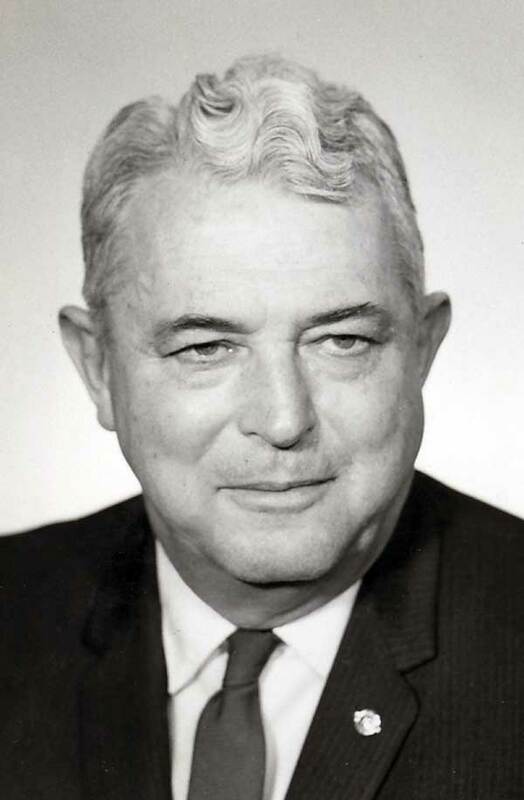 Staley served as superintendent of public instruction for Alamance County while living in Graham with his wife, Martha L. Pearce, before the couple moved to Suffolk, Va., where Staley served as pastor of a Christian Church parish. In 1894, Staley agreed to serve as a non-resident president of Elon, without salary or an expense account, and began making frequent trips between the college and his home in Suffolk. As the second president of the new college, Staley oversaw plans that brought Elon out of debt for the first time and paved the way for much-needed improvements to the campus. A dormitory built in 1968 was named Staley Hall in his honor. Born Oct. 22, 1839, on a farm near Graham, N.C., William S. Long (1889-94) spent his life working in Alamance County to provide quality education for young men and women. He operated a junior college in Graham, opened Graham Female Seminary in 1865 and served as the superintendent of public instruction for Alamance County. 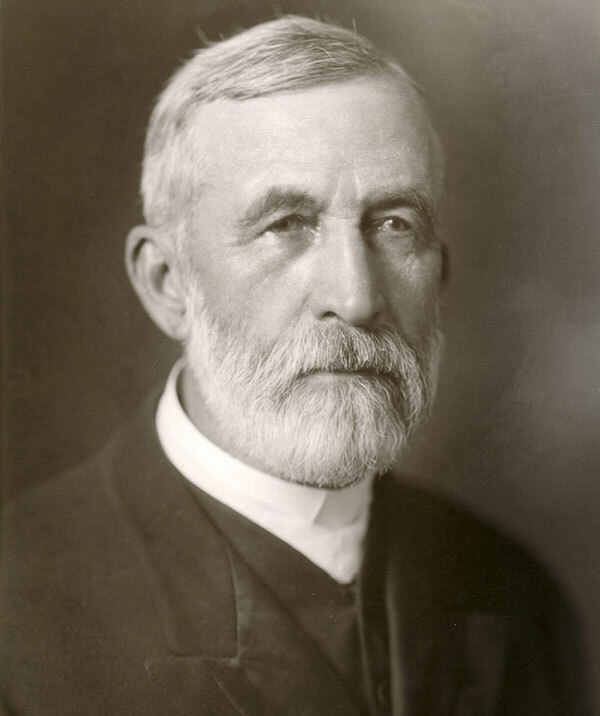 His dream of establishing a four-year coeducational college in Alamance County was realized in 1889, when he and other dedicated educators received the official charter for an institute they planned to build in the Mill Point village west of Burlington. 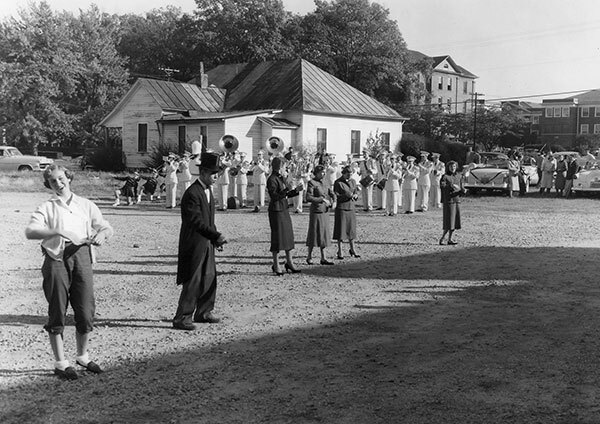 Ground was broken, foundations laid and the infant school was named Elon College. The village was later renamed for the college. Long served as a professor and as president of Elon from its founding until his resignation in 1894. This event takes place every fall for incoming first-year students to give their commitment to the Elon Honor Code. Honesty, integrity, responsibility and respect are the core values Elon students seek to uphold and serve as the backbone of the Elon Honor Code. Each of the four class presidents lights a candle onstage to represent these four core values. First-year students are joined by numerous alumni and older students as they receive the symbolic honor coin and recite the Call to Honor. West opened in 1905 for females only. The building originally included an annex, which contained a dining hall for both male and female students of the college. 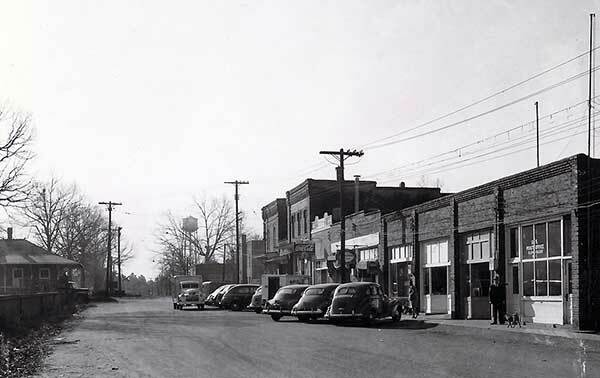 West featured state-of-the-art architectural features for its time, including fire walls and fire doors. Such features helped save West in 1942 when a fire destroyed the annex but left the main building intact. Because it is the only building to have survived the 1923 fire, West's architectural style of red brick and white columns and trim has guided Elon's design aesthetic for nearly a century. 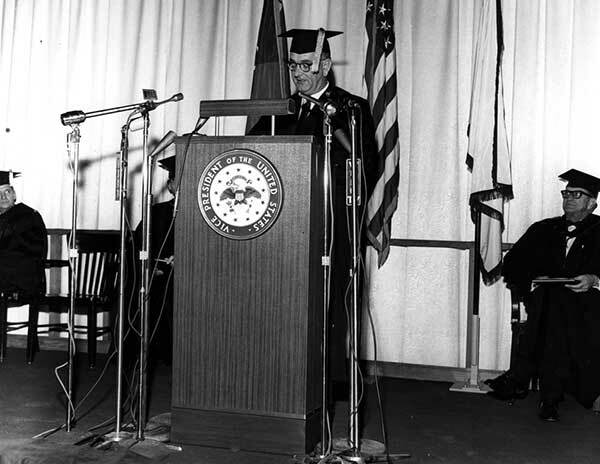 The tradition began in 1991 with the Commencement address by Furman Moseley '56. 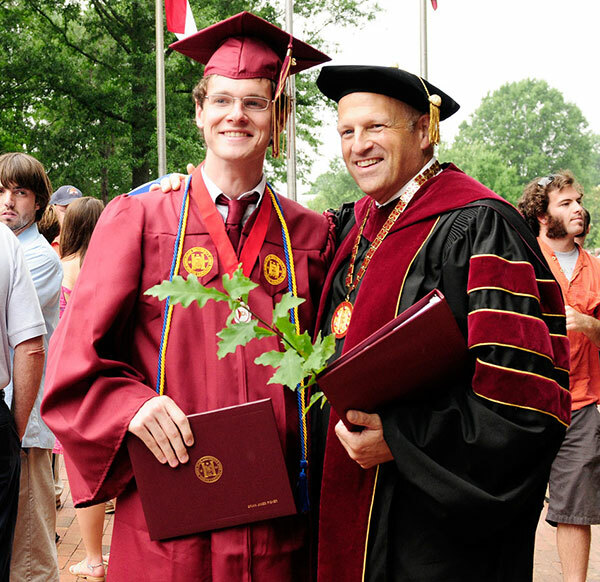 Moseley spoke of his career in the timber business and gave each graduate a redwood sapling. 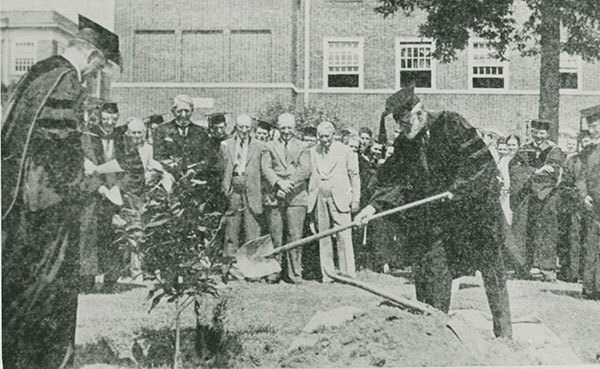 President J. Fred Young decided to make the gift of saplings a permanent Commencement tradition in 1992. Instead of a redwood sapling, Young opted to give each student an oak sapling in recognition of the Hebrew origin of the school's name. When Leo M. Lambert became president, he built upon Young's tradition by giving each new student an acorn, symbolizing the beginning of their Elon journey, at the end of New Student Convocation. This is a seven-day celebration of student achievement in research and the arts held each April. The centerpiece of CELEBRATE! Week is the Spring Undergraduate Research Forum, or SURF, when students and faculty showcase their projects in poster sessions and presentations campus-wide. SURF became an annual campus tradition in the 1990s. When the university established CELEBRATE! Week in 2006, art exhibitions, panel discussions, and dance, music and theatrical performances were included in the week surrounding SURF to illustrate the university's excellence in the arts and sciences. 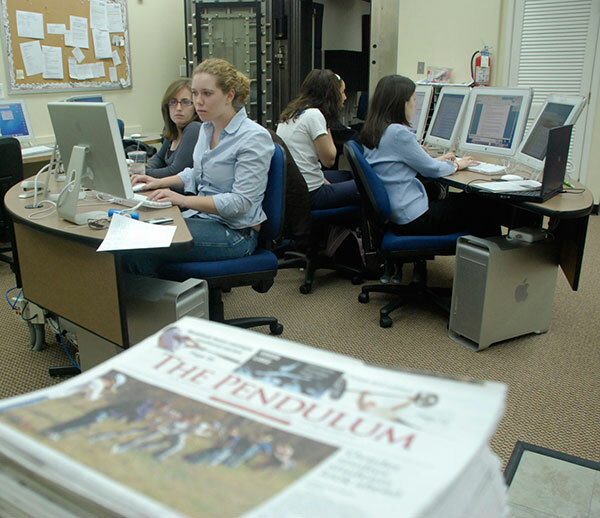 Founded in 1974, The Pendulum is produced by 20 editors and 50 to 100 staffers, reporters, photographers, and business and advertising workers. The paper's online and print versions cover major sports events, internationally recognized speakers, entertainment and the campus community. The Pendulum drops on Wednesdays during spring and fall semesters and on occasion during winter and summer terms. Visit The Pendulum Online. Browse older editions here. The Fall Convocation speaker typically, but not always, is the author of the university's Common Reading selection. 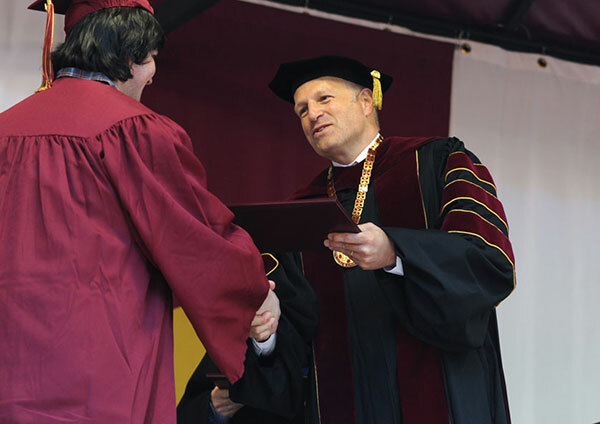 For example, in 2009, Khaled Hosseini headlined Fall Convocation while his novel, A Thousand Splendid Suns, was Elon's 2009-10 Common Reading selection. 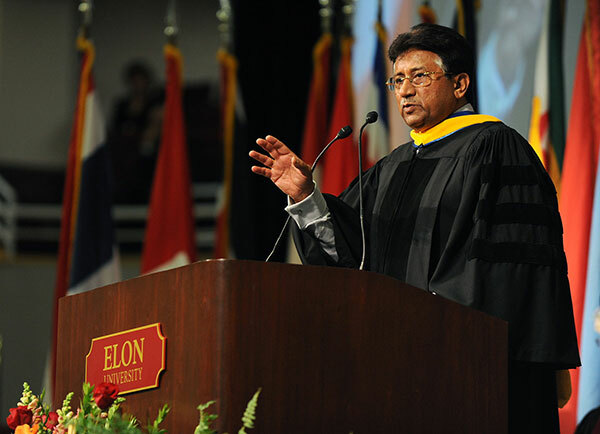 Other Fall Convocation speakers have included two Pulitzer Prize winners, historian David McCullough and columnist Anna Quindlen, and the former president of Pakistan, Pervez Musharraf (pictured), among others. 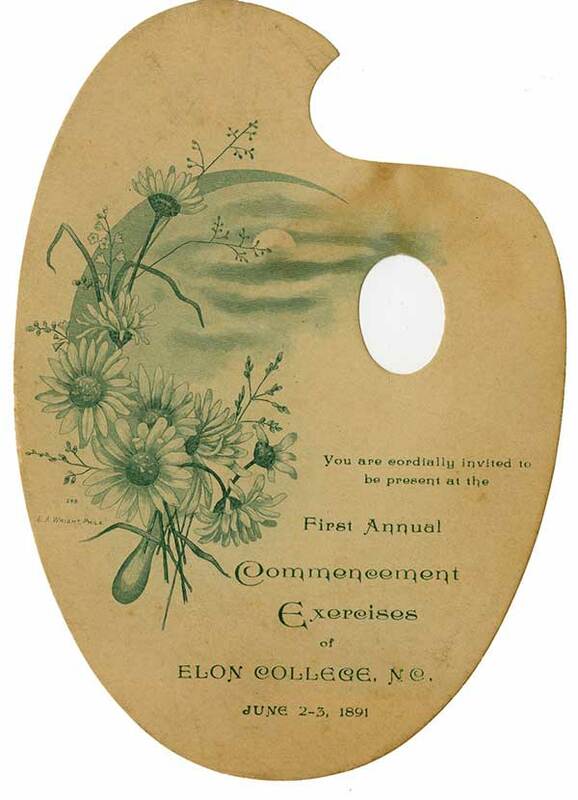 Since the first Commencement exercises, held June 2-3, 1891, all Elon graduates have had their names read in full at Commencement and received their diploma, a tradition rare for institutions Elon's size today. 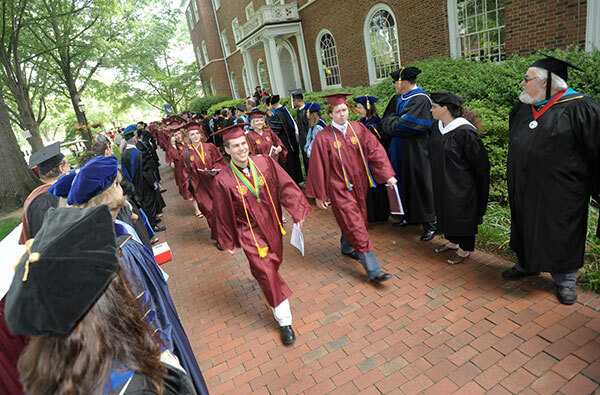 On their way to their Commencement ceremony, graduates take one last walk along the brick paths as Elon students from Koury Athletic Center to the area Under the Oaks. They pass through rows of robed faculty and staff, and many share heartfelt congratulations, hugs and goodbyes with their students. For many years, there were separate spring and summer Commencement exercises, but now only a spring undergraduate Commencement is held in late May. 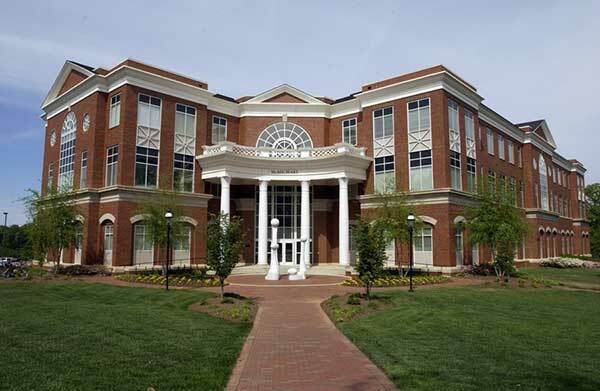 Also held in May are Commencements for the Elon MBA program and the Elon University School of Law. 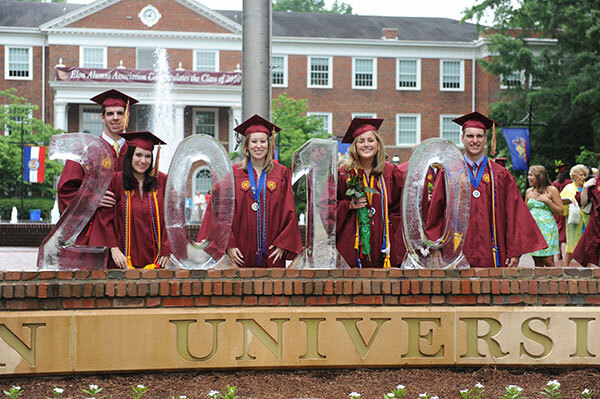 Elon master of education students graduate each August and doctor of physical therapy students graduate in December. 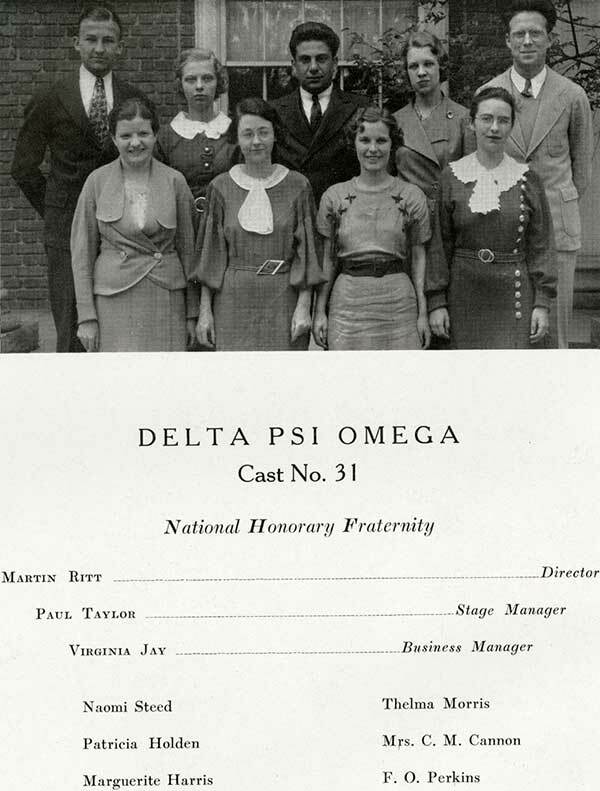 The first Founders Day celebration was on Sept. 14, 1939. There were many years when it was not celebrated, but it has been held annually since 2000. 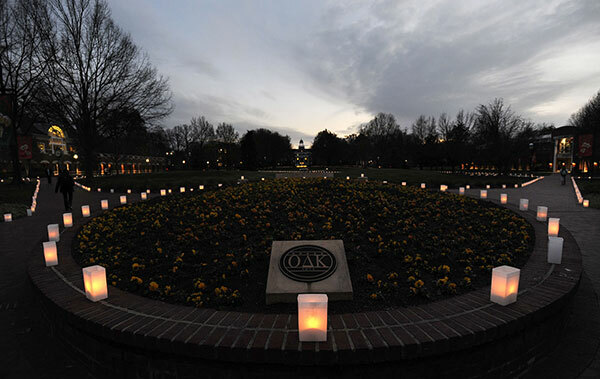 Its purpose is to honor the lives of administrators, faculty and staff, trustees and alumni who have impacted the growth of Elon. 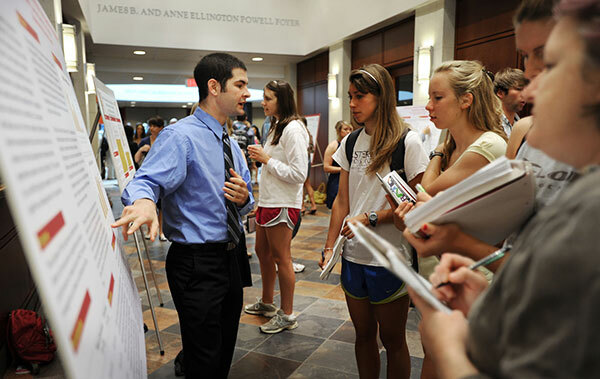 It also serves as a means of educating the campus community about Elon history. Although Elon's archives include references to events called 'Honors Convocation" before 1995, the current Convocation for Honors was established on April 28, 1995, during the visit of former British Prime Minister Margaret Thatcher. The ceremony typically features an address from an accomplished guest speaker. It also honors graduating seniors, master's and doctoral candidates, as well as underclassmen who received honors over the preceding academic year. In addition, selected faculty, staff and university benefactors are recognized. Previously known as College Chapel, this weekly gathering is among the oldest of Elon's traditions and was once a mandatory part of student life. Today, students, faculty and staff meet each Thursday from 9:50 to 10:20 a.m. for interfaith reflection and inspiration. Numen Lumen is the perfect time to rejuvenate your spirit during the hustle and bustle of life on campus and serves as a weekly reminder that the purpose of an Elon education is to develop the whole student—mind, body and spirit. One of Elon's most cherished traditions, College Coffee is held every Tuesday, 9:40 to 10:20 a.m., during the fall and spring semesters at Phi Beta Kappa Commons in the Academic Village. The entire Elon community unites for conversation over coffee and pastries. College Coffee as it's known today was established in 1984 by President Emeritus J. Fred Young, who had heard of a similar tradition at Davidson College. It has been held in various locations on campus, including Scott Plaza and Young Commons, before relocating to Phi Beta Kappa Commons in fall 2009. Young's College Coffee initiative was preceded by similar student-organized events in the early 1980s. In the 1980-81 academic year, the Student Government Association hosted "weekly coffees" on Thursday mornings in the Long Student Center's second floor. In February 1983, then-SGA President Ted Reinheimer '83 hosted an SGA Faculty/Student Coffee to "talk about problems and present new ideas." The Elon community gathers each December to share hot chocolate and cider, sing holiday songs of all faiths, light a Menorah and stroll through more than 2,000 luminarias set up around Young Commons and Scott Plaza. Campus buildings and trees are lit with more than 50,000 lights, and the decorations stay up through early January. Students, faculty and staff join with family and friends for the joyous celebration. Right before winter break, all Elon students are invited to Maynard House, the residence of Elon's president, to celebrate the holiday season with hors d'oeuvres and desserts. Students have the opportunity to take a holiday photo with President Leo M. Lambert and his wife, Laurie, that is sent to the student's home over the break. 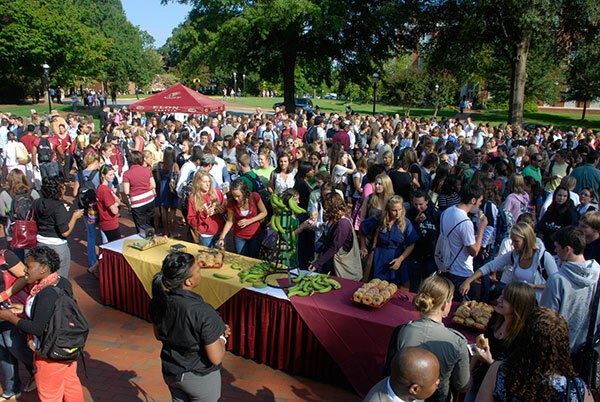 Family and friends return to campus, generally in late September or early October, to visit their Elon students and participate in numerous events. This tradition began Nov. 5, 1966, and was called Parents' Weekend. The name of the event changed to Family Weekend in 1993 to include grandparents and other extended family members. ElonTHON is Elon's version of Dance Marathon, a fundraiser benefiting Duke Children's Hospital in Durham, N.C. Students of all years are encouraged to get involved in the event, which requires them to literally dance the night away, staying on their feet for 24 straight hours. This is Elon's largest student-run fundraiser, bringing in tens of thousands of dollars each year to help families at Duke Children's Hospital with medical expenses. ElonTHON began in spring 2003. The Rev. Richard McBride, Elon's chaplain from 1984 to 2009, established this celebration in spring 1998 as a way to honor the important milestone of turning 21 years old. The event is held each semester, and all students who turn 21 years old during that semester are invited to the dinner and may bring one faculty or staff mentor to be their guest. 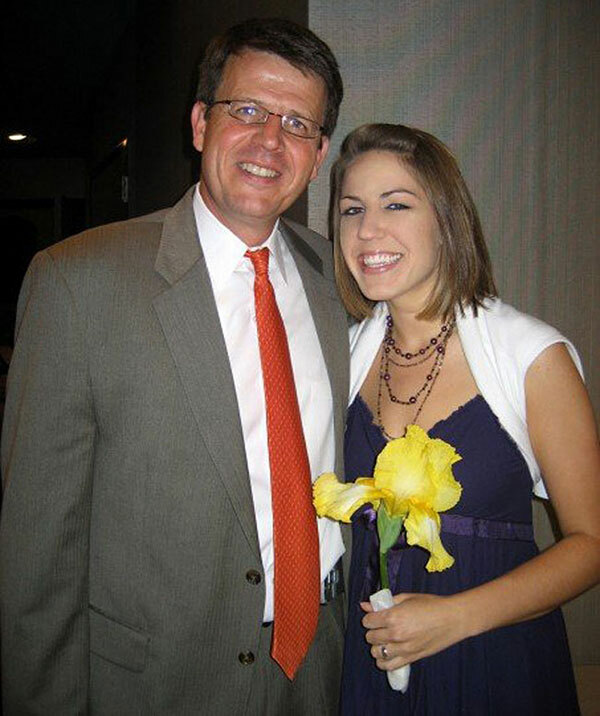 The idea came to McBride after attending an event friends held for their daughter recognizing her entrance into adulthood. "I wanted to help people recognize the transition that occurs in life. It's a marker," he said. "Our culture doesn't do well with marking transitions." 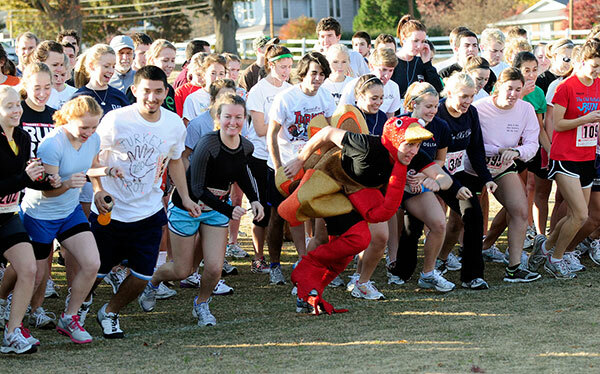 The Turkey Trot began in 1991 with fewer than 10 students participating, but has grown into a popular annual event at Elon. Each November, hundreds of students, faculty and staff gather to run the five kilometer trail around campus while contributing canned goods to a local agency benefiting the community. In 1895, 11 of Elon's first graduates united to establish the Elon Alumni Association, which strove to keep "the memory of college days among the alumni, and to keep their support united for the good of the college." 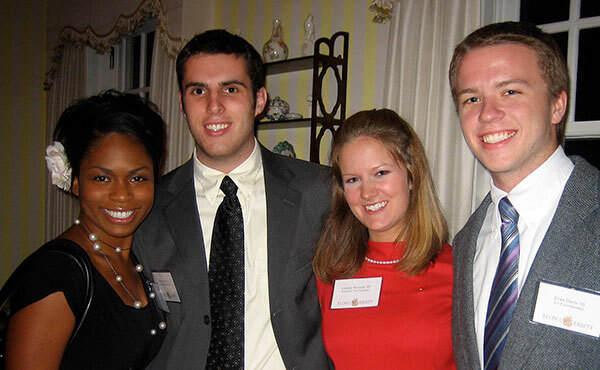 To meet those goals, the association sponsored reunions to bring graduates back to campus. 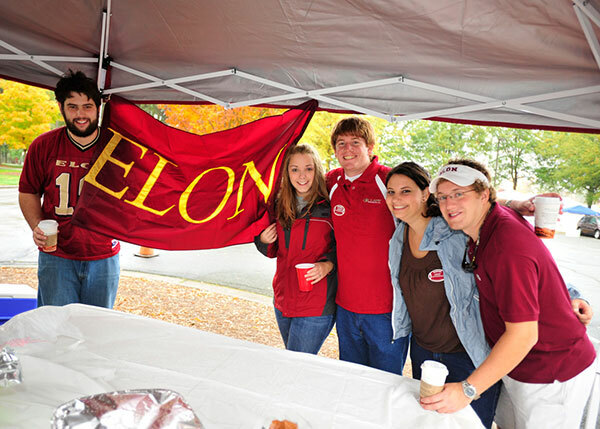 One such reunion, an annual October/November event called "Homecoming Days," is mentioned in Elon communications dating to the early 20th century. Though the specifics of the celebration have changed considerably in the past 100 years, the spirit remains the same, bringing to the forefront the indelible link between Elon's past and present. 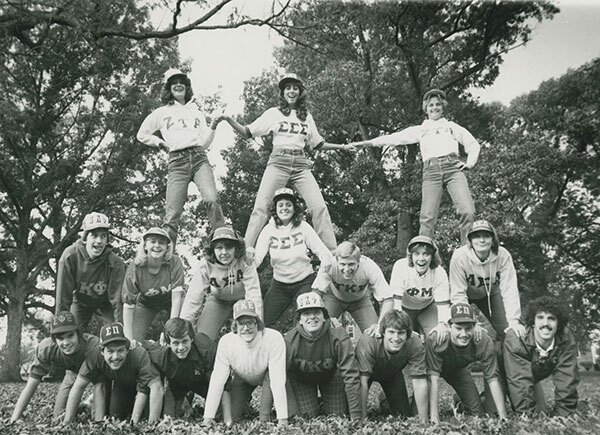 Elon's first Greek Week was held in April 1975. All the activities started on a Tuesday afternoon with a parade, and included field day events and a skit competition at night in Jordan Gym. As Greek Week evolved over the years, the competition eventually included homemade boat races across Lake Mary Nell, tennis, golf, archery, bike races, eating contests and swimming. 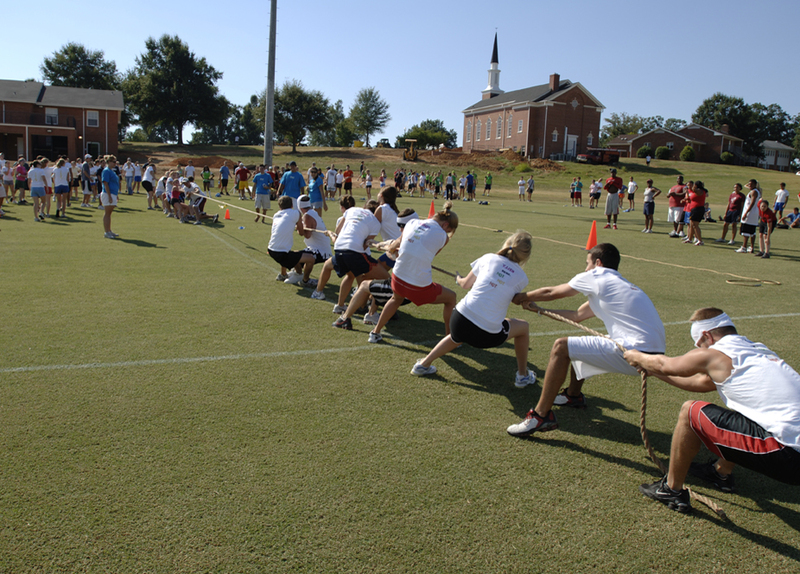 Other activities over the years have included sack races, centipede races, egg and Frisbee tossing, football and softball throwing, and tug-of-war. Today, the centerpiece event of Greek Week is the annual Dance Competition, during which fraternities and sororities from Elon's three Greek councils present choreographed performances for the student body. Elon 101 is a one-credit fall semester course for first-year students that helps them acclimate to Elon's academic and campus climate. There is conflicting evidence about the origin of the Elon 101 course. A 1989 article in The Pendulum stated that it began in 1983. But it did not appear as an official course in the academic catalog until the 1988-89 edition and was not included in the official course schedule until fall 1989. ESTV was created in 1992 by Christopher Waters '94. 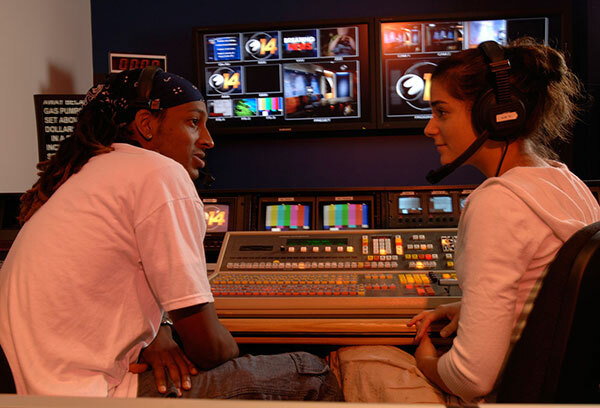 Hundreds of students work in some capacity each year producing ESTV entertainment, news and sports programming, including "Phoenix14News," Elon's live weekly newscast, and the "Win Stuff" game show. The organization constantly encourages students to pitch their ideas for new shows. 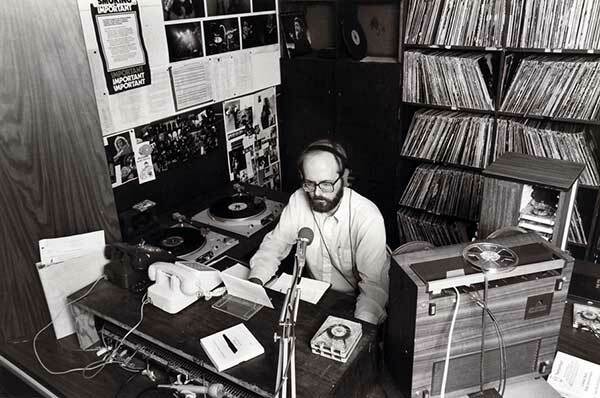 In spring 1975, students established an FM radio station whose call letters stood for "Wonderful Sounds of Elon." WSOE began regular broadcasts on Oct. 6, 1977, from its original studio in Moffitt Hall. Today, WSOE's signal reaches as far west as Greensboro, N.C. and eastward to Durham, N.C., and broadcasts 24 hours a day. 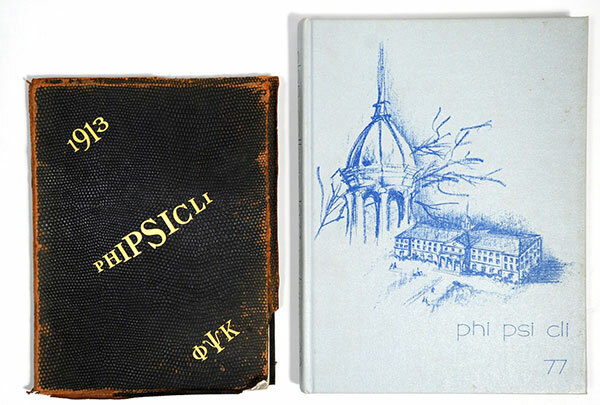 Founded in 1913, Elon's yearbook is named for the original three literary societies at Elon - Philologian, Psiphelian and Clio. The group employs several student editors and traditionally carries sections covering student life, people, sports, organizations, arts, study abroad and academics. Yearbooks are distributed free to students. Visit Phi Psi Cli Online. Browse older issues here. 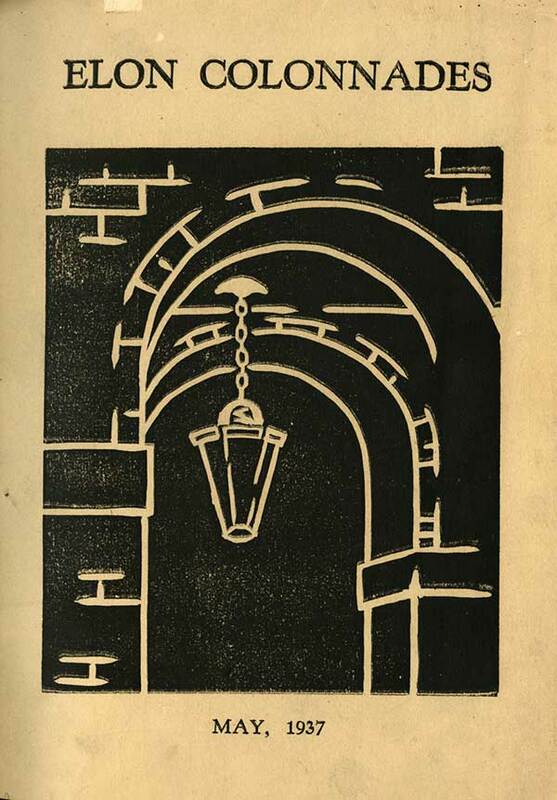 In 1937, Elon published the first issue of Colonnades, an annual literary periodical containing 35 contributions from student writers spanning 27 pages. Recent editions of Colonnades have grown to encompass more than 100 pages and feature not only nonfiction, fiction and poetry but also original art and photography. The magazine is published each spring and provided free to students, faculty and staff. 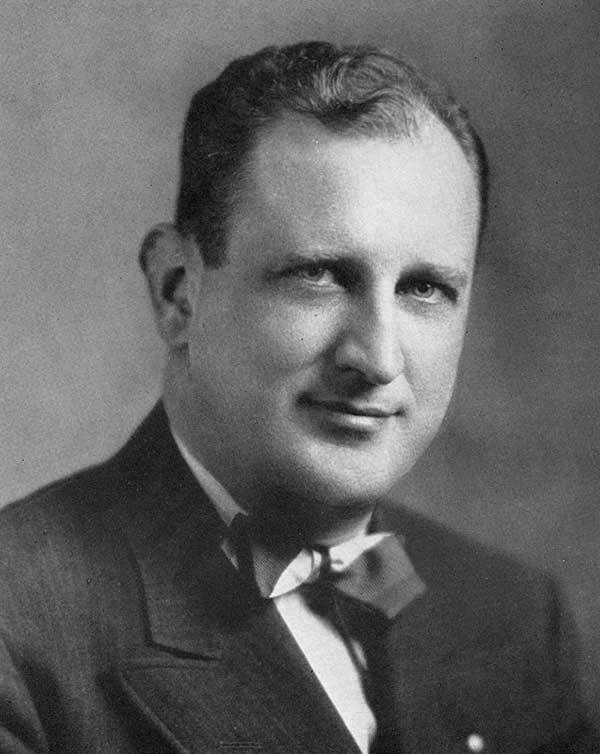 Thad Eure became North Carolina's secretary of state in 1936 and served under 13 state governors. 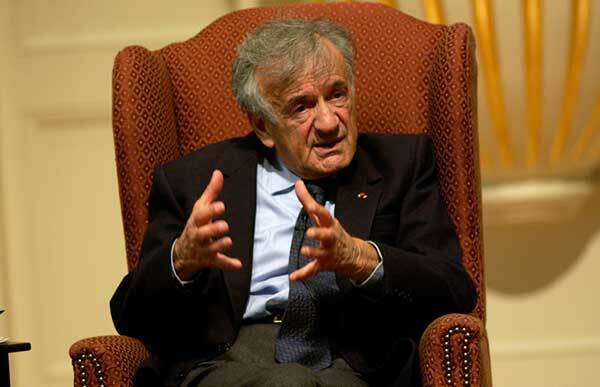 He was a champion for common citizens and children and insisted the door to his office never be closed to the public. He also had extensive family ties to Elon. 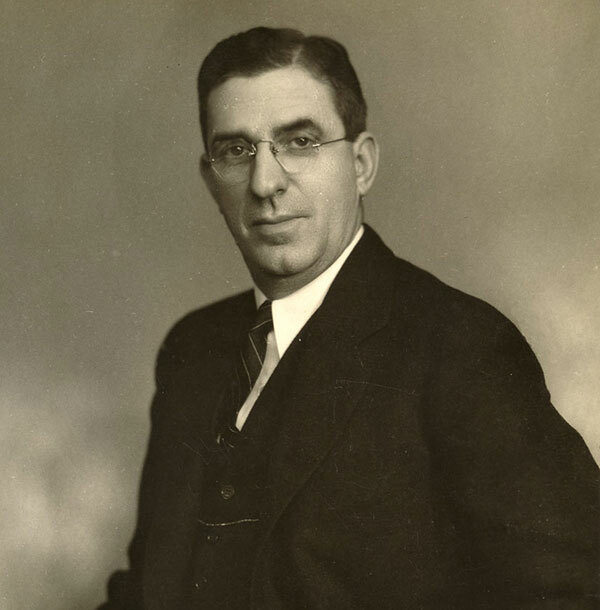 Remaining faithful to Elon, Eure joined the board of trustees in 1942. He offered a booming voice and gave powerful speeches on campus, ending each with the pronouncement, "Long Live Elon!" This tradition continues today at Commencement, when graduates join the university president in hailing their alma mater. The Elon school colors are maroon and gold. In 1907, faculty wanted Elon's colors to match the colors of the three literary society groups - the Philologian, Psiphelian and Clio societies - which were garnet, white and blue. However, the athletes wanted to match the two-tone color scheme of rival schools. 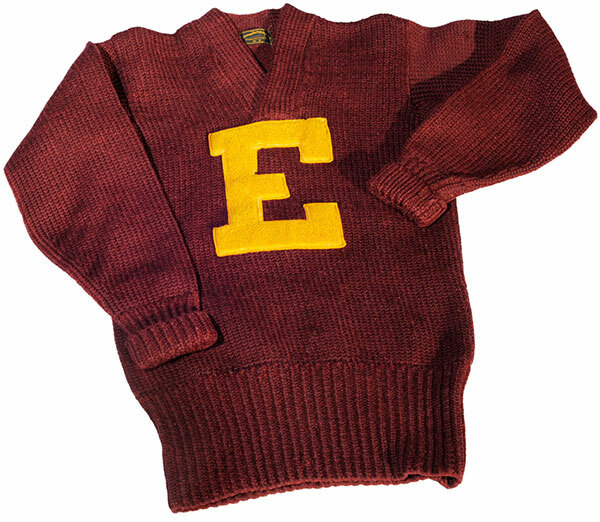 A committee of faculty was appointed in 1909 and they chose maroon and gold, which have been Elon's official colors ever since. The official seal was created in 1908 by Professor Walton C. Wicker and adopted by the board of trustees. Many of the seal's symbols draw from Masonic culture, about which Wicker was quite knowledgable. 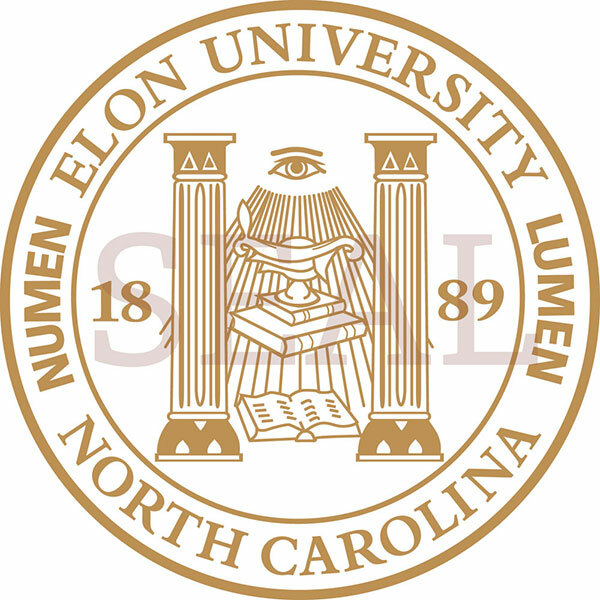 The words "Elon College, North Carolina" and "Numen Lumen" are written around the outer rim; the word "college" was replaced by "university" in 2001. Two pillars that represent power and strength sit in the middle of the seal, along with the Holy Bible and several other books. The Bible refers to the religious foundations of Elon, and the books represent culture and knowledge. The candlestick and flame represent the light that members of the Elon community spread throughout the world, and the "All-Seeing Eye" is a representation of those keeping watch over the institution. The founding year of 1889 is also on the seal. Read more about the seal here. The university's motto, "Numen Lumen," incorporates the Latin words for "spiritual light" and intellectual light." 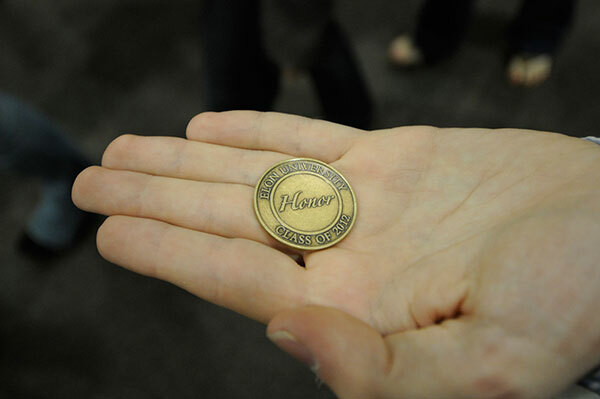 This motto inspired the name of Elon's premier award that recognizes scholarship, the Lumen Prize. 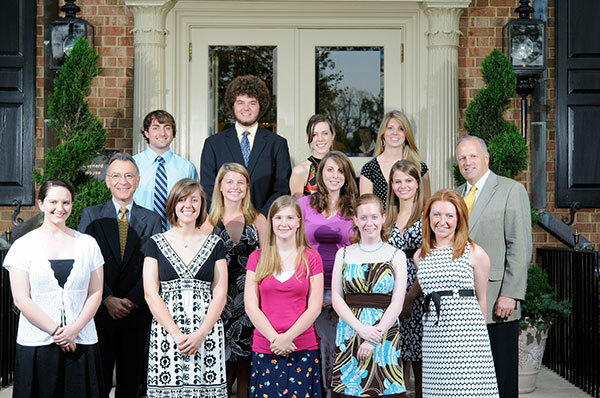 Established by President Leo M. Lambert and the board of trustees, the inaugural Lumen Prize recipients (pictured) were selected in 2008. The prize is awarded to rising juniors through a competitive application process, and each scholar receives a $15,000 scholarship to support and celebrate their academic and artistic achievements and potential. The mace is an ancient symbol of authority. The Elon University mace, given in memory of Elon professor Alonzo L. Hook, is carried in academic procession by a senior member of the faculty. 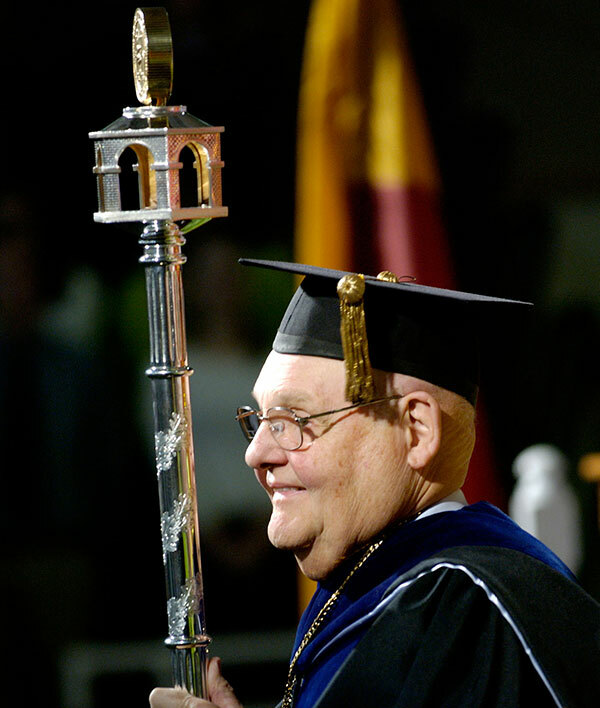 The Elon mace was first carried by President Emeritus J. Earl Danieley '46 at the Centennial Convocation on April 25, 1989. Approximately 40 inches in length, the Elon University mace was handcrafted in Portugal of sterling silver and gilding and incorporates many symbols. The shaft of the mace is ornamented with bands of oak leaves and has four sections that represent the four years of study. An acorn, symbolizing the seed of learning, is carved at the top of the shaft. The head of the mace is a six-sided replica of Elon's colonnades, complete with open arches and brickwork, which signify strength and stability. The mace is crowned with the Elon seal. Read more here. The Elon fight song is played at all Elon sporting events. At football games, the song is played by the Fire of the Carolinas, Elon's marching band. At basketball games, the song is played by the university Pep Band. The fight song is played to the tune of F.E. Bigelow's march, "Our Director." The lyrics were written by Elon student and band director Mark Z. Rhodes '23 in 1921. Elon broke ground for Alamance in May 1923 to replace the Main Administration Building, which was destroyed in the January fire. Alamance was named after the county in which Elon resides and its residents, many of whom donated funds to build the new building. The building was intended to be part of an "H"-shaped area of academic buildings. Crushed bricks from the remnants of "Old Main" were reused in Alamance's foundation. The cupola atop Alamance, which houses a bell, has become one of the university's most identifiable symbols. 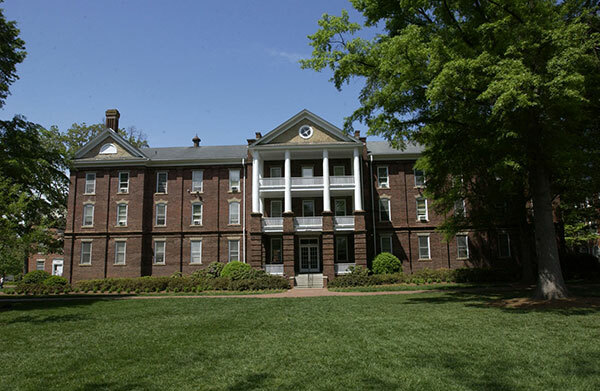 The oldest part of campus, which lies within the original campus walls, includes the 'H"-shaped academic quad (Alamance, Powell, Duke, Carlton, Whitley and Mooney), Long and McEwen Communications buildings, McEwen Dining Hall, and Sloan, Virginia, West, Smith, Carolina, Hook, Brannock and Barney residence halls. Many of these buildings are named in honor of past presidents, faculty and Elon community members, a tradition that largely has continued for buildings constructed in the modern era. Several significant structures have been built and razed since Elon's founding. North Dormitory was built in 1912 and was intended to house male students on the upper floors and a gymnasium on the ground floor. The building was frequently called the Alumni Building and was razed in 1959. 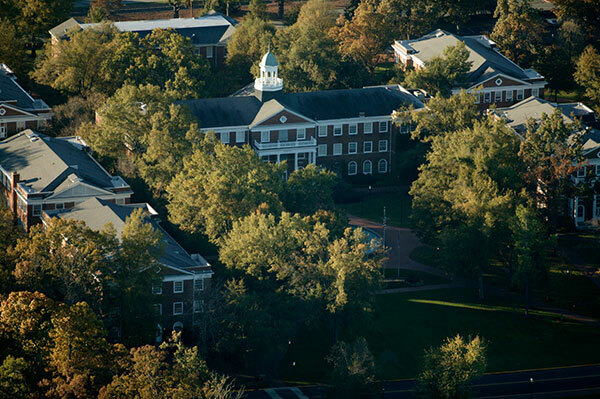 The Main Administration Building was the first building built on campus and housed much of Elon College's operations in its early years. 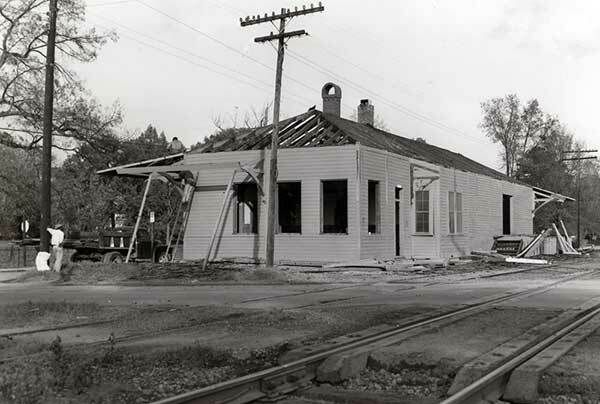 The building was destroyed by the January 1923 fire and its remnants were razed. 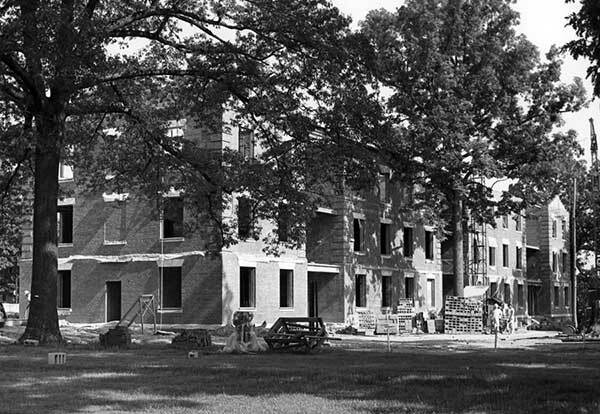 East Dormitory was the first dormitory built on campus, with construction beginning shortly after the college started building the Main Administration Building. It was intended to house female students and was named for its location to the east of "Old Main." While it survived the 1923 fire, it was gutted by another fire in July 1966. For many years, Elon had a power plant that furnished electricity for the entire campus. The power plant stood in the footprint of the current Carol Grotnes Belk Library. In addition, part of the campus served as a working farm at one point. 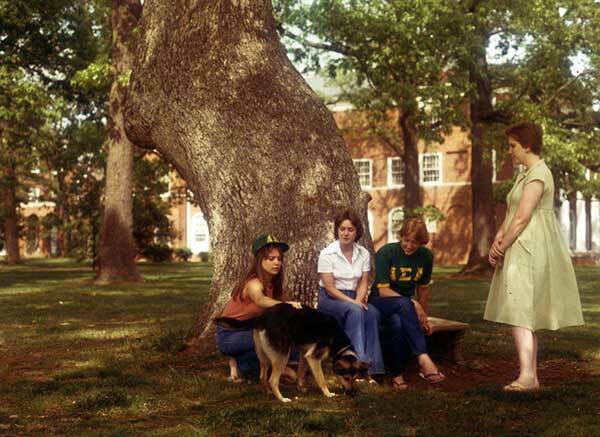 The Senior Oak was an Elon icon from its earliest days until its demise and removal in 1980. As men worked to clear a grove on the land upon which Elon would be built in 1889, a tree that stood near where West Residence Hall is located today "grew from the ground in a curve the height of a man before its trunk straightened out," wrote Elon alumnus and historian Durward Turrentine Stokes '64. William S. Long, Jr., son of Elon's first president, encouraged his father to save the old white oak for its aesthetic value, so it was spared. For decades, the tree, dubbed the Senior Oak, became the go-to spot for photographs, friendly gatherings and marriage proposals. But in 1980, the tree was struck by lightning, died and was cut down the following year. The Senior Oak lives on as a collectors' item. The felled tree was cut into more than 800 pieces that were given to Elon donors, and also was incorporated into various artifacts, some of which can be seen in the Elon archives. 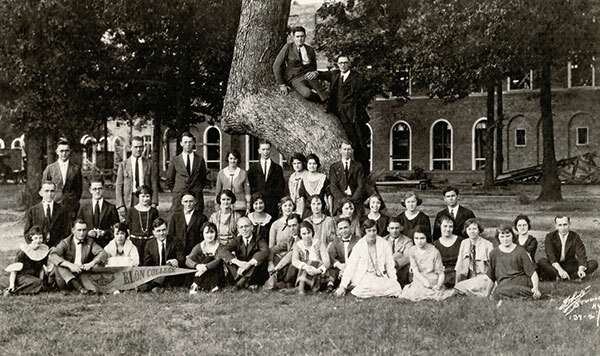 The location of the Senior Oak has been a matter of debate for more than three decades, but photographs indicate it stood in the Under the Oaks area, near the south entrance of Whitley Auditorium and just north of the parking lot shared by McEwen, West and Whitley. The Class of 1990 relied upon such approximations when it planted a replacement oak on the spot, but that tree perished as well. 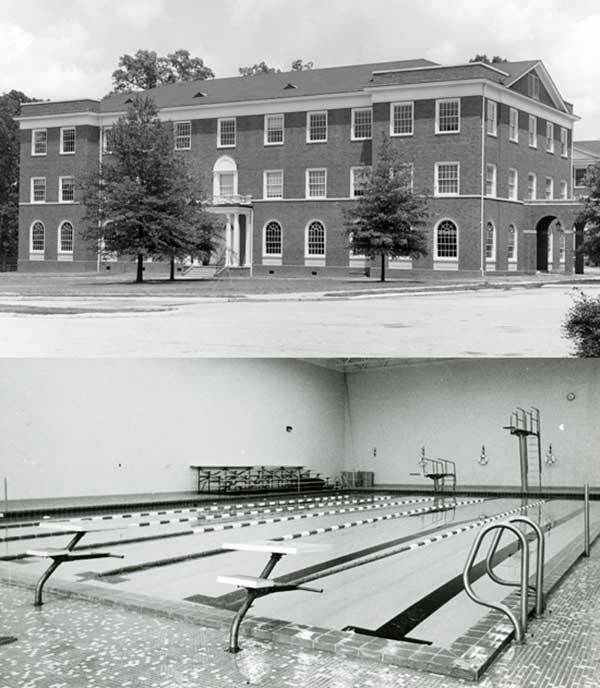 Jordan Center, built in 1980, was originally intended to serve as temporary student housing, yet the six-building dormitory complex on Elon's west campus stood until 2006, when it was razed and replaced by The Oaks. 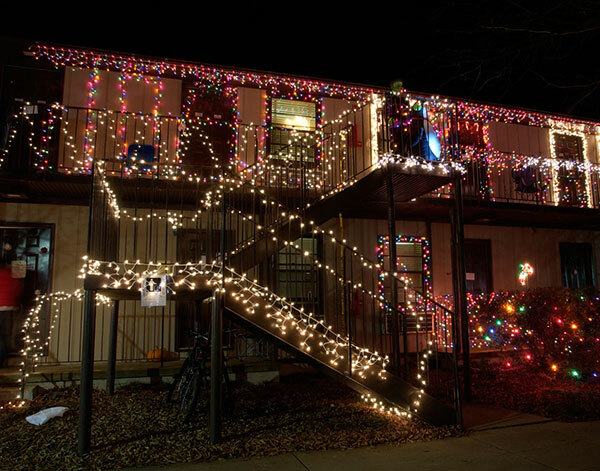 "J.C.," as the area was commonly known to students, became a campus attraction during the holiday season, when the residents of each building banded together to adorn their units with lights and holiday decor in an annual competition and exhibition. Amazingly, in 25 years, not a single dorm or student was damaged or destroyed in the proceedings. Memorial Stadium at Burlington's Walter Williams High School played host to a generation of Elon football, from 1949 through 2001 when Elon's on-campus venue, Rhodes Stadium, opened. 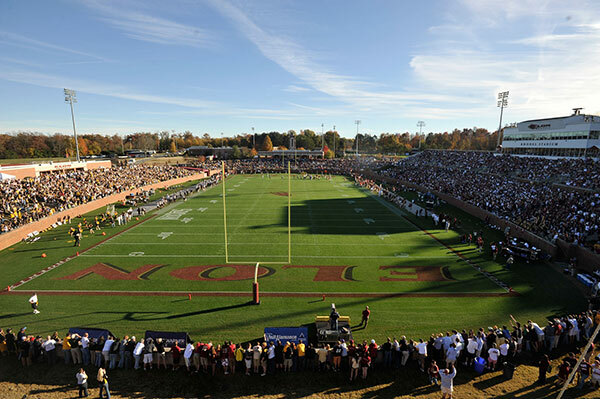 Memorial Stadium notably was the site of Elon's back-to-back national championship victories in 1980 and 1981. 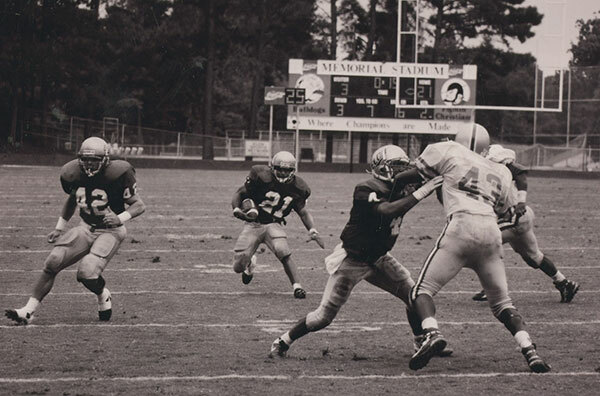 Prior to using Memorial Stadium, Elon's earliest football teams practiced and played on various fields on or near campus. The "Old Main" bell served as a beacon for Elon's earliest students, calling them to class and chapel from its perch atop the tower of 'Old Main," the first building constructed on Elon's campus. But on the morning of Jan. 18, 1923, wrote Stokes, 'the old college bell, making its last clank, plummeted down from the tower" as "Old Main" was engulfed in flames. The bell survived its fall mostly intact. 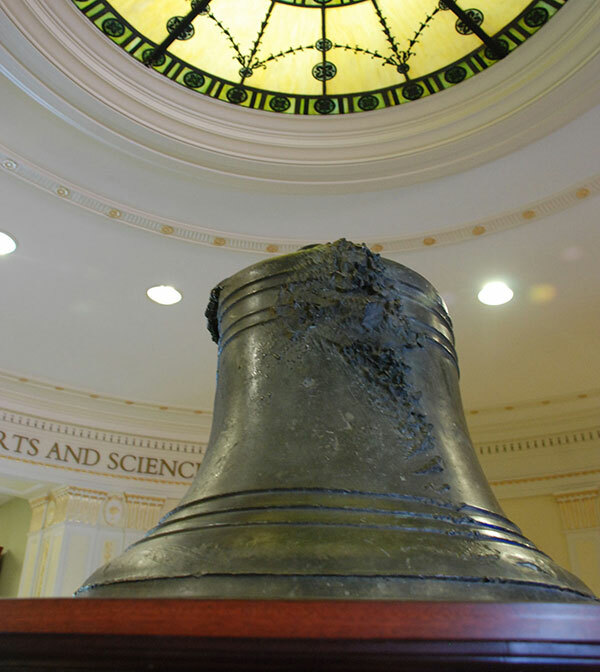 After it was plucked from the rubble, the bell was housed in various rooms and closets on campus. Raymond Beck '75 discovered references to the bell's existence while researching another aspect of Elon history and remembered seeing the relic in a closet in the former Carlton Library. Along with Professor Emeritus George Troxler and a metallurgist from North Carolina State University, Beck tracked down the bell and confirmed it as the one that hung in "Old Main." In summer 2010, the bell became part of an exhibit in Alamance Building. It sits on a podium surrounded by plaques explaining its history. When the founders of Elon selected a name for the institution, they settled upon "Elon," the Hebrew word for "oak," in reference to the large grove of oak trees that stood on the land where the college was built. As men worked to clear that land, several large oaks were spared - and stand in front of where West Dormitory stands today. This area, known as Under the Oaks, is the site of the annual New Student Convocation in the fall and Commencement exercises in the spring. 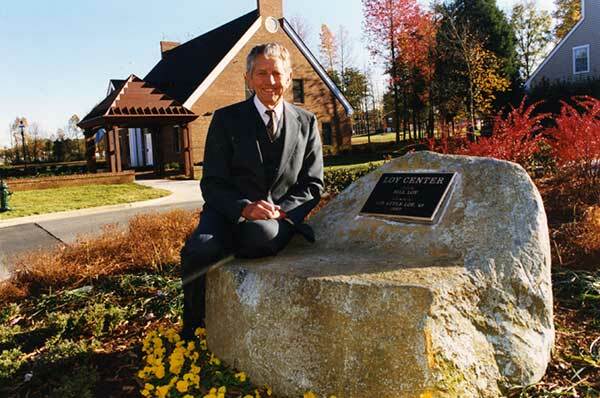 This space was dedicated on Oct. 10, 2000, to honor President Emeritus J. Fred Young and his wife, Phyllis J. Young. 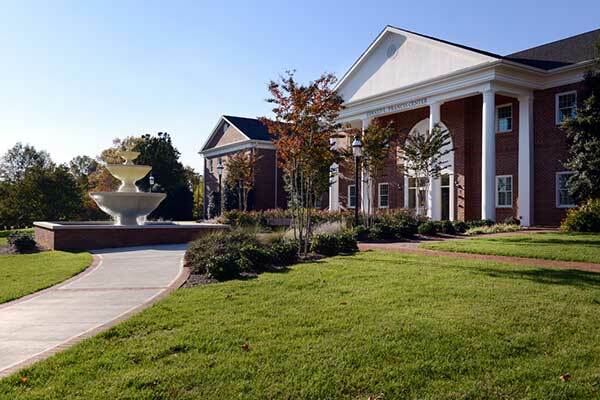 "Young Commons, which connects the historic and new campuses and unites the intellectual, physical and social dimensions of Elon life, stands as testimony to the Youngs' leadership and vision," declared the Young Commons dedication program. 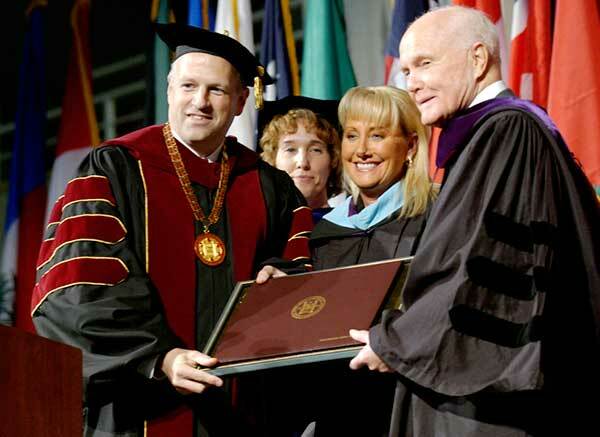 During Young's 25-year tenure, Elon grew from a small, regional college to a university that ranked in the top-10 of Southern master's-level universities. Alumni Gym is home to Elon's men's and women's basketball and volleyball teams. It also hosts major Elon events throughout the year, including Fall Convocation and the spring Convocation for Honors, and ElonTHON, among others. Alumni Memorial Gymnasium was built as part of a campus expansion plan in the post-World War II years. It was dedicated Dec. 2, 1950, during halftime of a men's basketball game between Elon and the University of North Carolina at Chapel Hill. The Class of 1950 unveiled its gift to Elon, a bronze plaque listing the names of the 37 Elon alumni who died in World Wars I and II, to whom the building is dedicated. The plaque still hangs in the north entrance to Alumni Gym. 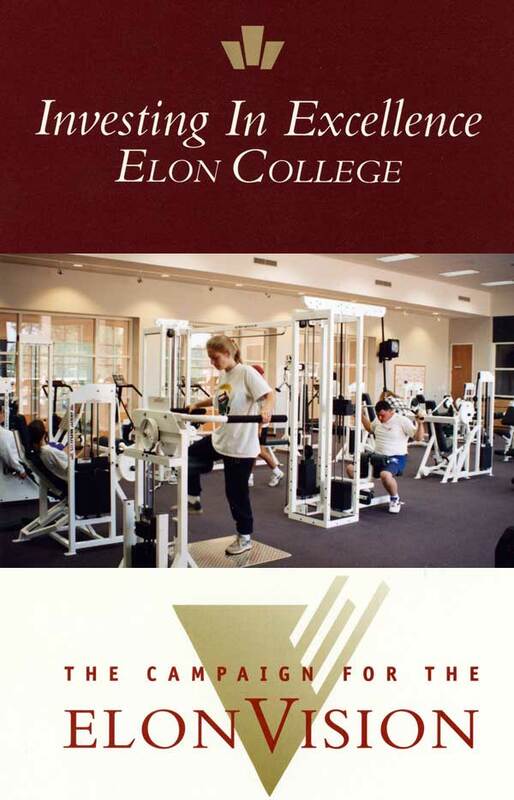 In 1992-94, Alumni Gym underwent renovations as part of the Koury Center construction. In 2010, work began on a second renovation to the gym that provided new seating, many technological upgrades and a new playing surface named Robertson Court to honor trustee Jeanne Robertson and Jerry Robertson, Elon parents whose major gift supported the renovation. In August 2001, Elon commissioned John Hair to design the 11-by-9-foot sculpture that stands near the entry road to the North Athletics Complex. The sculpture was dedicated in fall 2003, and the Fire of the Carolinas marching band performed at the ceremony. Hair intended for his creation to intimidate opposing teams, but he said the final product went far behind his initial vision. He studied Greek mythology to get a feel for the history of the phoenix and began incorporating unique aspects into the sculpture's design through geometric form. Reading the story of the phoenix, a mythical bird that rises from its own ashes, Hair focused on the continuous cycle of renewal that symbolizes the phoenix's immortality. "There is a feeling of the Elon spirit of revival, how one can triumph over adversity through personal strength," Hair said of his work. 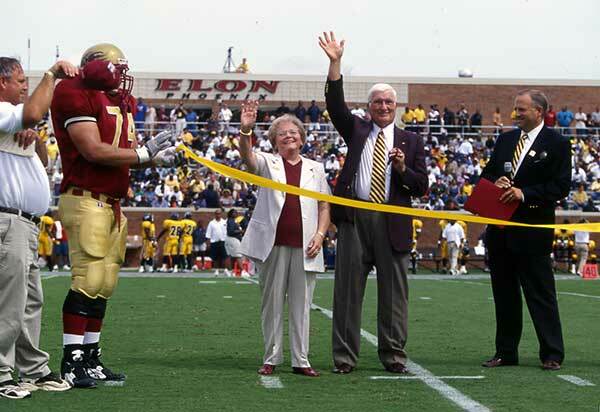 On-campus football returned to Elon in 2001 with the opening of Rhodes Stadium in the North Athletics Complex. The stadium, named for trustee Dusty Rhodes, his wife, Peggy, P'86, and their family, opened its doors for the first time on Sept. 22, 2001, to host a matchup between the Phoenix and the Aggies of North Carolina A&T State University. 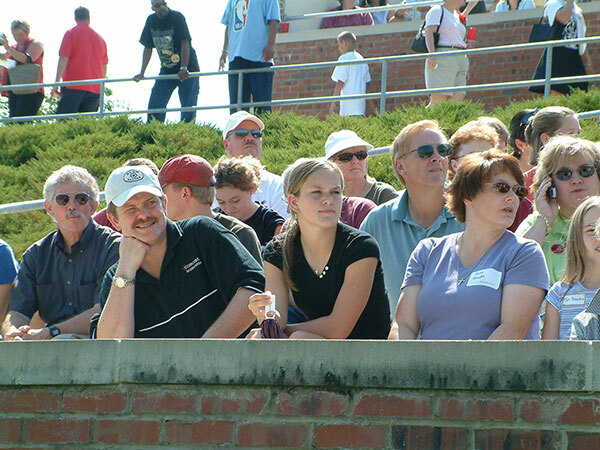 The largest crowd recorded to date at Rhodes Stadium assembled Nov. 14, 2009, when 14,167 fans watched Elon battle Southern Conference foe Appalachian State. The playing surface in the stadium is named McKinnon Field in honor of trustee Bob McKinnon '62 and his wife, Ray. The Theos Arch, under which Elon fans enter the stadium, is named for the late Nick Theos '56, a former Elon football player. Furman Moseley '56 made a gift to name the arch for his friend and former teammate. In front of the stadium stands the Alan J. White Bell Tower, dedicated in September 2006 following the retirement of Elon's longtime athletics director. Trustee Jeanne Robertson P'89 and Jerry Robertson P'89 made a gift to build the bell tower in honor of White, their longtime friend. On March 11, 1889, the North Carolina General Assembly issued a charter for Elon College, a four-year coeducational institution founded by the Christian Church. The name Elon, the Hebrew word for a grove of oak trees, was chosen to describe the school’s 87-acre wooded site at Mill Point. 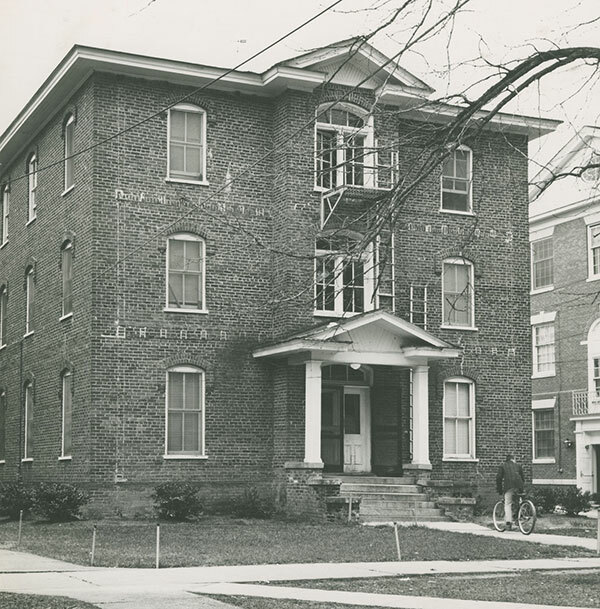 Founding President William S. Long supervised construction of the first buildings, including Main Building, which stood near the location of Alamance Building, and East Dormitory. Bricks came from a clay quarry and brickyard located on today’s South Campus. 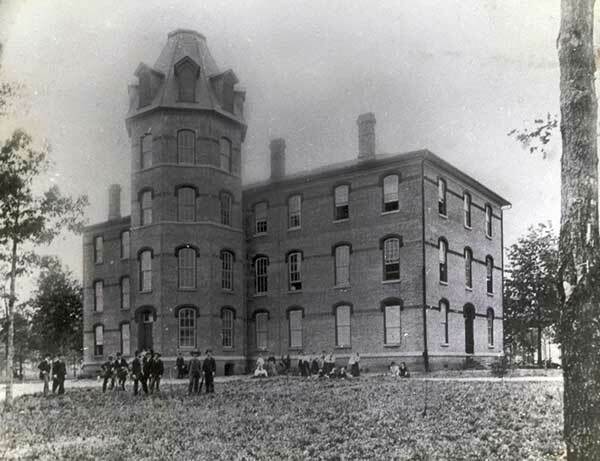 An inaugural class of 76 students enrolled in September 1890, taught by President Long and six faculty members. The building housed much of Elon College's operation in its early years, including the administrative offices, library, chapel and most classrooms. 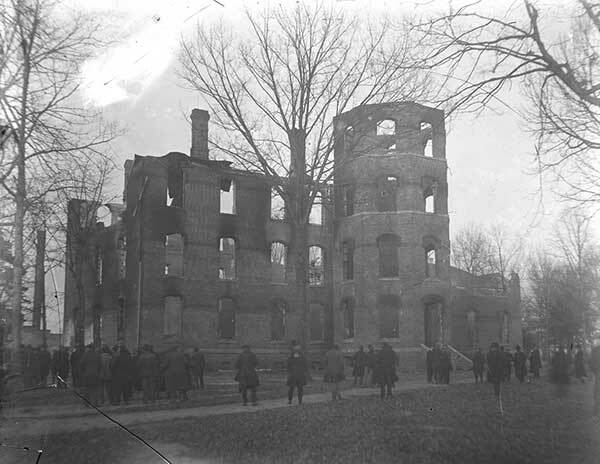 Also known as “Old Main” and “The College,” the building was destroyed by the January 1923 fire and its remnants were razed. 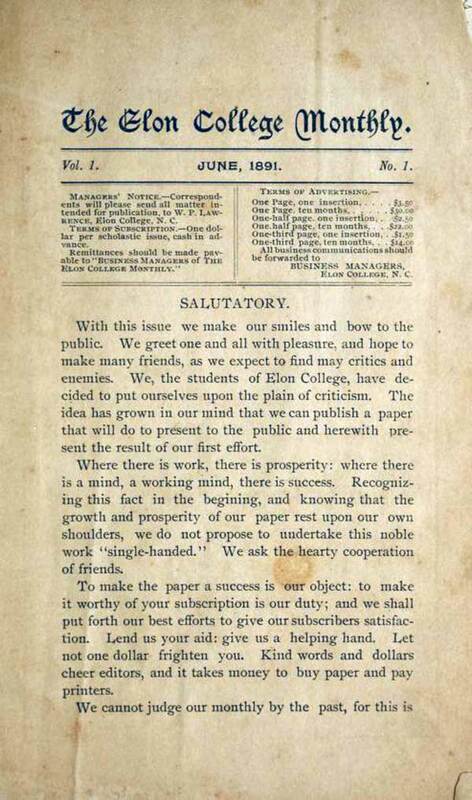 The Elon College Monthly was first published in June 1891, marking the debut of the first medium for student expression at the college. The publication included articles and personal items written by students and included a few ads. It was published by the three Literary Societies at Elon: the Philologian, Psiphelian and Clio societies. Nathaniel G. Newman, C.C. Peel and Herbert Scholz make up the first graduating class. 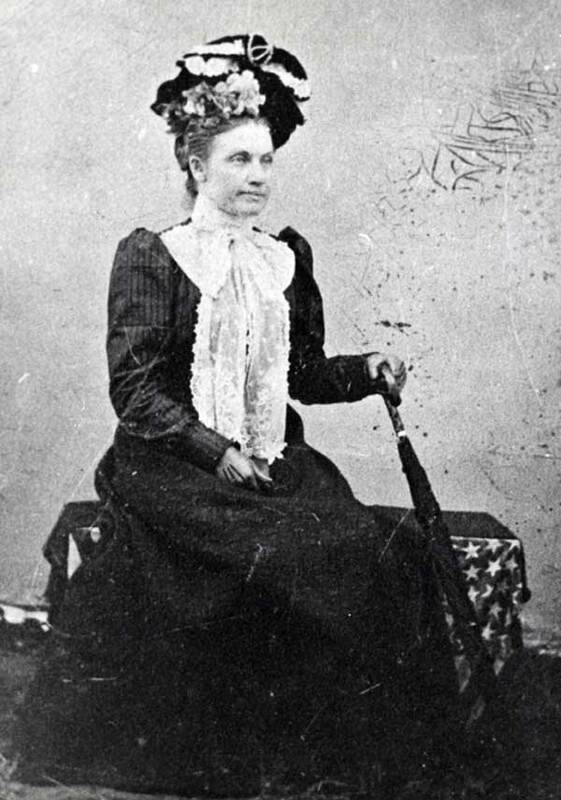 M. Irene Johnson is the first female graduate and becomes first female faculty member. She represented the entire graduating class that year. Glee Club, the first student musical group, is also formed. 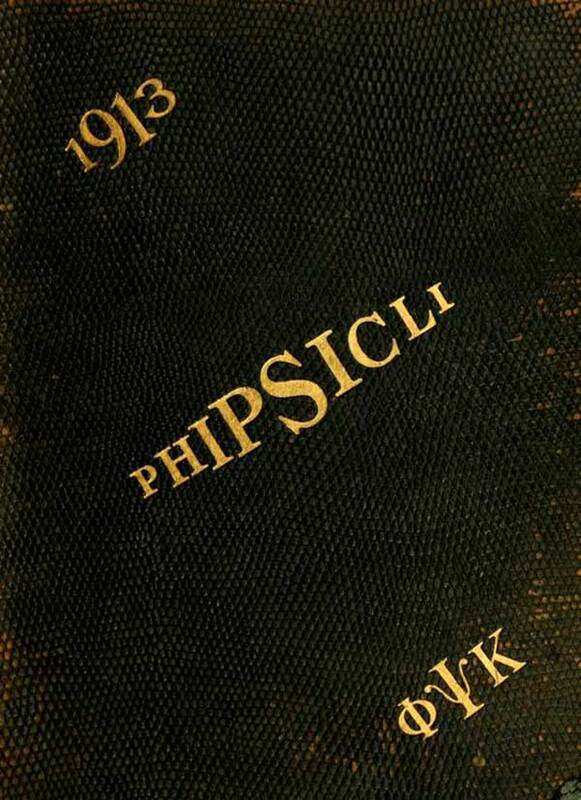 The yearbook is named after the three original Literary Societies at Elon: the Philologian, Psiphelian and Clio societies. 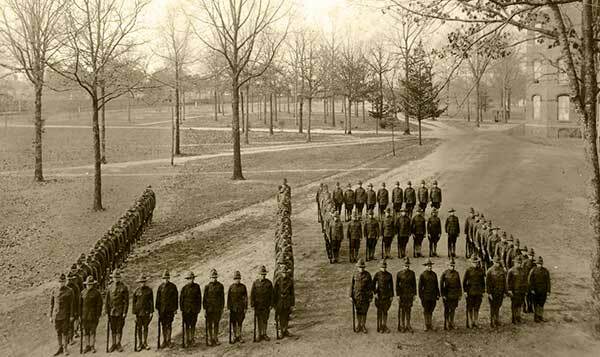 The senior class shrinks from 46 to 30 as men enlist to fight in WWI, but the college continued its program even though seriously handicapped. Before the conflict ended, the total number of Elon students and alumni in service reached 601, of which 15 were casualties. On January 18, 1923, a fire destroyed Main Building, including all student and alumni records, the president’s safe and nearly all the library books. Noted as the most dramatic event in the history of Elon College, the fire caused an estimated $125,000 in damages. College trustees immediately voted to rebuild. The fire was first noticed by college sophomore, William B. Terrell, who was in another building and saw a small flame in a second story window in the Administration Building. The cause of the fire is unknown. 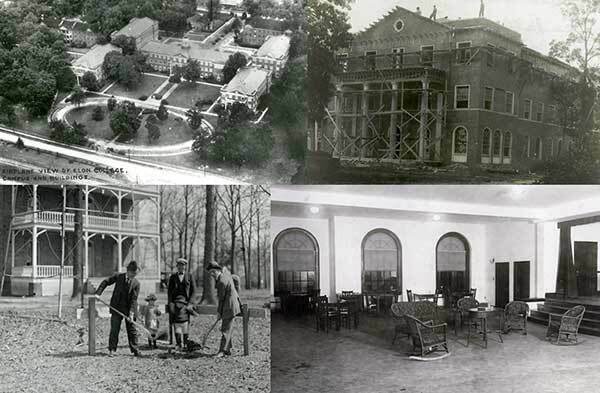 Alamance County residents are active in fundraising, rebuilding and expanding the college after the disastrous 1923 fire. 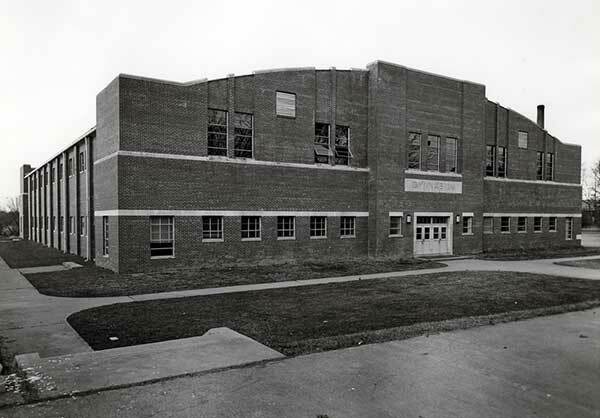 The cornerstone of the Whitley Auditorium was laid May 23, 1923. 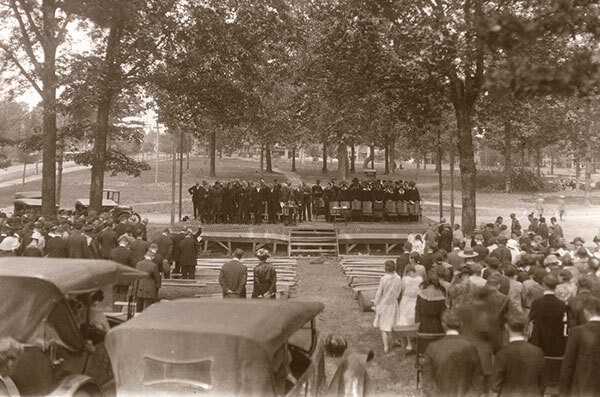 At the Commencement ceremony that year, the cornerstone of the Alamance Building was laid in the presence of a large crowd. Three three-story buildings are completed: Duke (containing science labs, classrooms and offices), Carlton (library) and Mooney (containing classrooms, offices, a small auditorium and meeting rooms for social and religious activities). During the Great Depression, with debt from campus construction, Elon faced financial collapse. 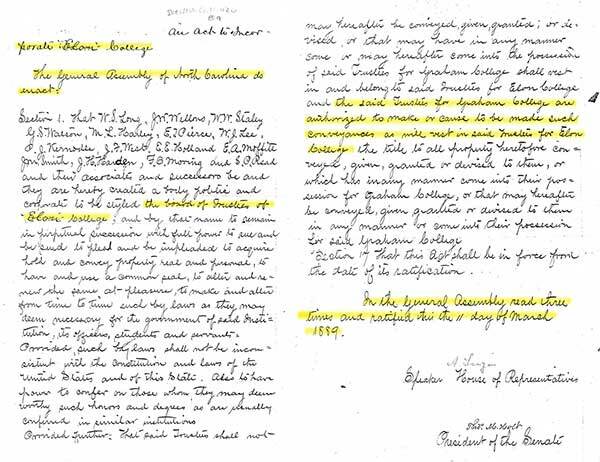 In 1931 enrollment declined from 400 to 87, faculty received almost no pay and President William Harper resigned. In 1932 the college lost its accreditation. President Leon Smith appealed to alumni and received donations of $3,000 to continue operations. He avoided arrest by a deputy sheriff looking for the college’s remaining assets, persuaded creditors to accept partial payments, convinced faculty to compromise on delinquent salaries and recruited many students from the defunct Atlantic University in Virginia Beach, Va. By 1943 the college was debt free. 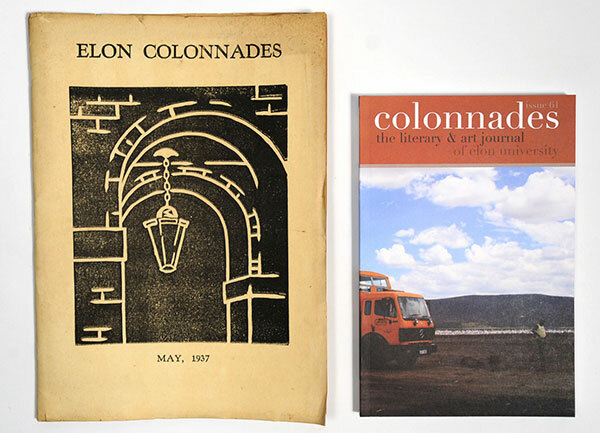 The first issue of the Elon Colonnades, the student literary magazine, is published in May. The 27-page issue included 35 contributions by students and a color cover. The editorial staff included 10 students under the supervision of English professor Fletcher Collins Jr.
W. Clifton Elder '25, a Burlington businessman and trustee of the college, is selected to receive the first outstanding alumnus award. He received a plaque and a citation during the Alumni Association's annual banquet. 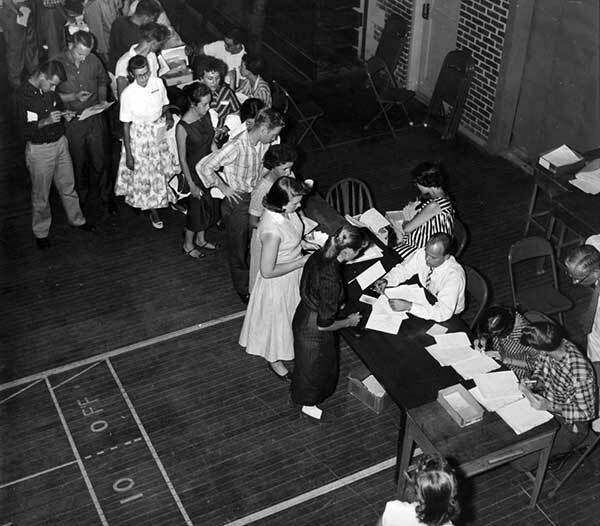 During World War II, Elon’s enrollment shrank from 580 to 370 and 13 faculty left for military service or war-related work. Students created the “V for Victory” club and the Student Service Organization to organize war efforts on the home front. 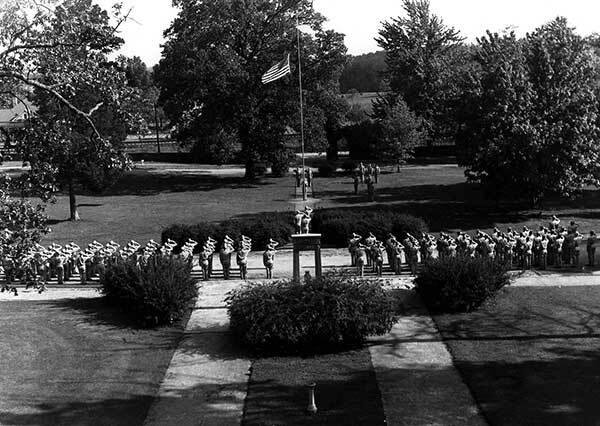 In 1943–44 the 325th College Training Detachment of the Army Air Corps was stationed at Elon, where 672 recruits were trained in academic subjects and pre-flight skills. By 1946 returning GIs increased enrollment to nearly 700. 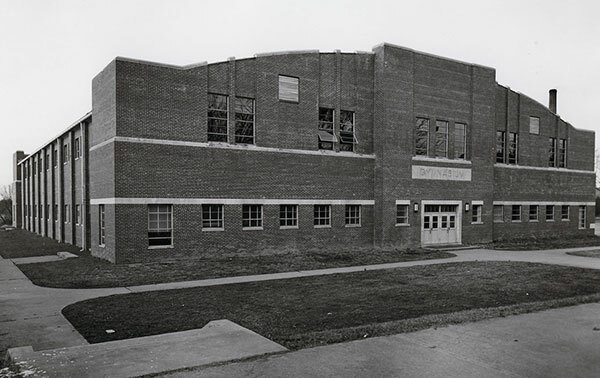 World War II claimed 32 Elon students and alumni, and Alumni Memorial Gymnasium is named in their honor as well. Elon played its first football game at Burlington Memorial Stadium in 1949. The Fighting Christians defeated the Edenton Marines 80-0. 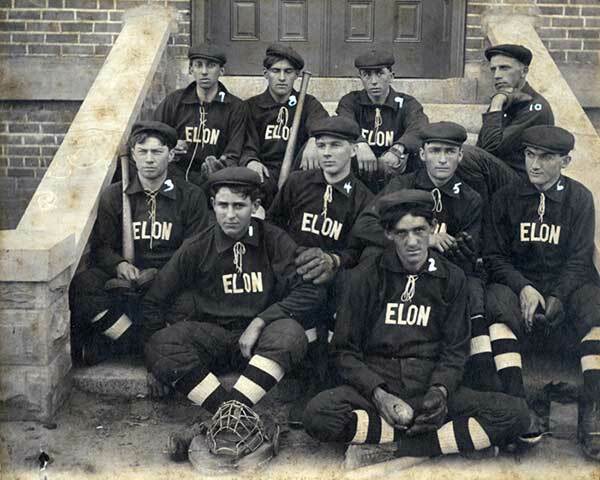 The term 'Fighting Christians' was first used during the 1922-23 sports season to describe the spirit of Elon athletes who proudly wore their Maroon and Gold uniforms. The facility was dedicated Dec. 2 to the memory of Elon alumni who died in WWI and WWII. The new building was not only used for athletic events but also for other functions including concerts, fairs, convocations and commencements. 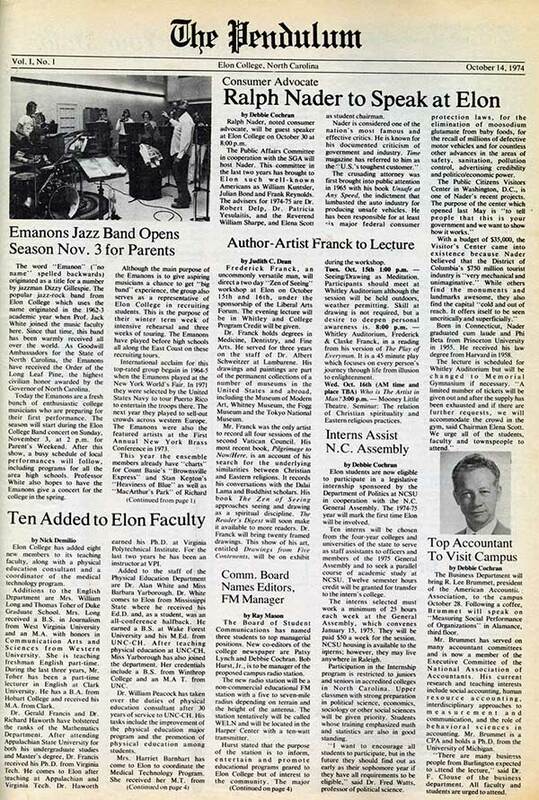 As Elon expanded its academic programs (it offered day and nigh school), enrollment sore from 705 students in 1953 to 1,070 in 1955. The campus was busy around the clock and lights remained on all night, a far cry from the past when lights were cut off at 11 o'clock each night. Trustee and N.C. Secretary of State Thad Eure drafts a new charter for the college, clarifying ownership and relationship with the church, which would still be related to the institution but would not own the college. Many of Elon’s first students arrived in 1890 at the depot next to campus, which was originally built for freight but later expanded for passengers, and included a telegraph office and post office. Trains stopped four times daily and the Southern Railway added a car on game days so students could travel to football and baseball games off campus. 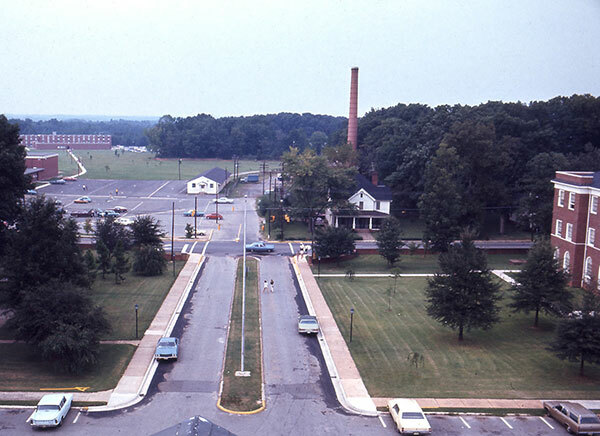 By 1961 the rail era had ended at Elon and the railroad demolished the depot, granting the strip of land on the north side of the tracks to the college for student parking. In 2010, the university partnered with the North Carolina Railway Company to build a pedestrian underpass to improve access to South Campus. 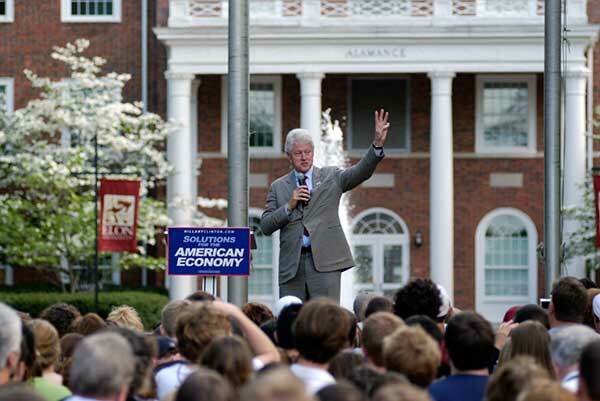 Johnson delivered a speech primarily on foreign affairs that was heard by the largest crowd ever assemble at Elon up to then. 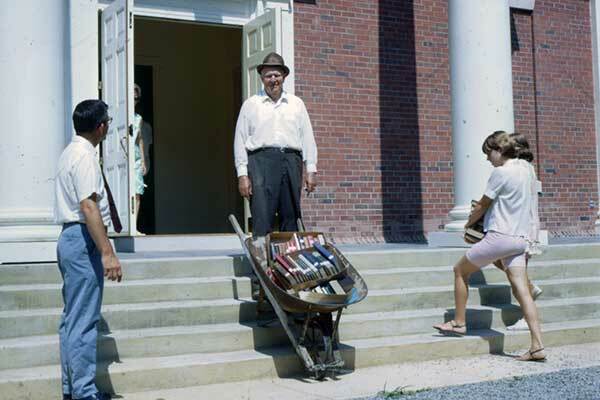 On July 15, 1968, about 200 volunteers carried armloads of books, transfering 67,000 volumes from Carlton building to the new Iris Holt McEwen Library. For each 10 loads of books carried, participants received a ticket. Ten tickets entitled the holder to a steak supper that evening. The card catalog was replaced by an electronic catalog in 1993 and computer workstations were added in 1995. Also that year, Tau Kappa Epsilon becomes the first nationally chartered fraternity on campus. 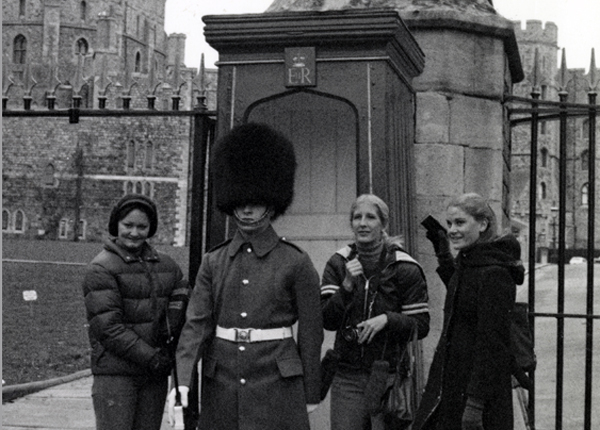 Elon’s first Winter Term in 1969 included a British history study abroad course based in London. Additional courses were soon added in Europe and by the 1980s courses were also offered in Russia, Israel, Egypt and Jordan. Bill Rich was named coordinator of study abroad in 1985, the same year as the first semester abroad program. 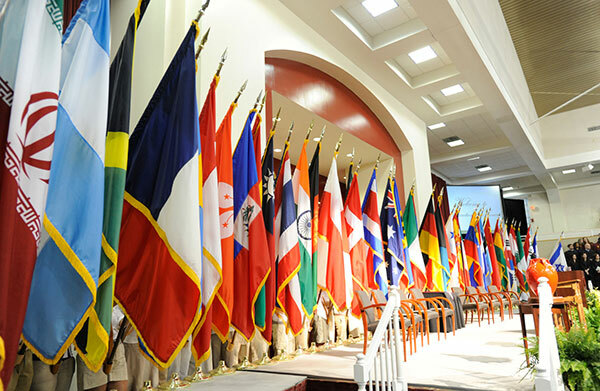 In 1999 a $1 million gift by Isabella Cannon ’24 endowed what is now the Isabella Cannon Global Education Center, and Elon received its first #1 national ranking in study abroad from the Institute of International Education. Today, Elon operates study abroad courses around the world and 72 percent of Elon grads have an international study experience.Students take the first study abroad trip to England. The Caroline Powell Building, formerly known as the Classroom-Office Building, opens. Jordan Gymnasium and Beck Pool are constructed. 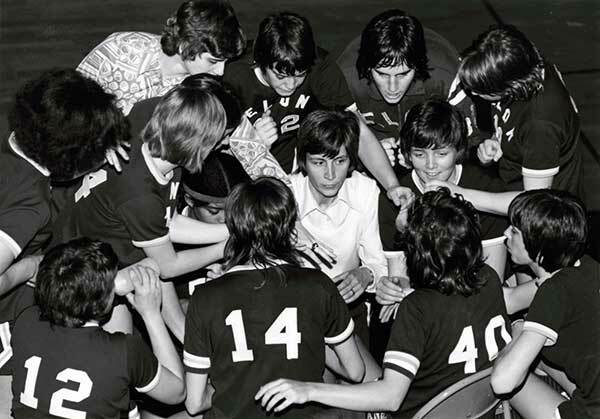 Basketball becomes the first women's varsity sport. In October, the first edition of the student newspaper, The Pendulum, was printed. Though the venture was poorly equipped at first-the editorial staff had a drafting table, T-square and two typewriters at their disposal-it soon became a permanent part of the college scene. 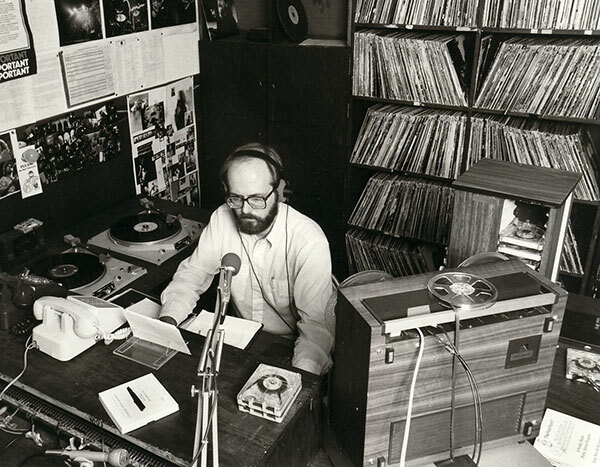 On Dec. 8, 1977, WSOE broadcasted for the first time on campus. The maximum range of the 10-watt radio station was roughly 20 miles. Programs included pop music played from records, campus news and educational presentations. Documentaries, profiles and other features were added later. 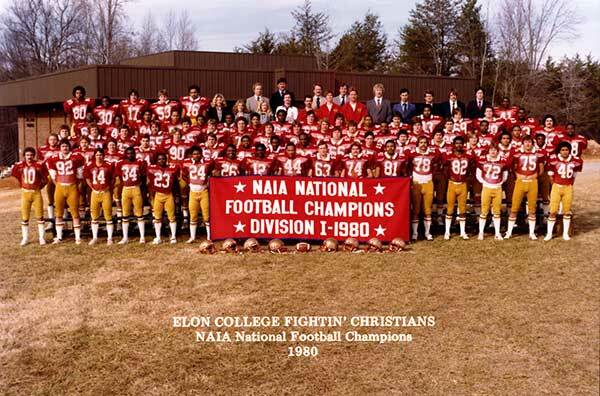 The Fighting Christians won back-to-back NAIA national football championships in 1980 and 1981. The 1980 squad finished 9-1 and ranked third in the NAIA. They won their first championship by a score of 17-10. The following year, they captured their second NAIA title in below-freezing temperatures on Phil Renn's 23-yard field goal, 3-0. The historic senior oak tree-the traditional place for photographs, first kisses and marriage proposals-dies and is removed. 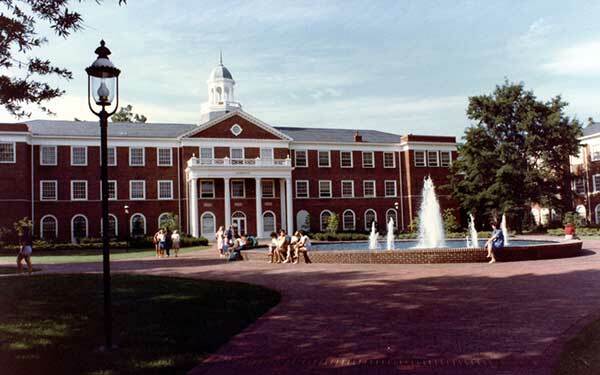 The 1982 construction of Scott Plaza and Fonville Fountain in front of Alamance Building is frequently cited as a turning point in the development of Elon’s modern campus. The area was previously an entrance road from Haggard Avenue and a parking lot for faculty and staff. The new master plan for the historic quad, conceived by landscape architect Wayne McBride working with President Fred Young, generated some controversy. Some likened Elon’s plans to creating Disneyland. 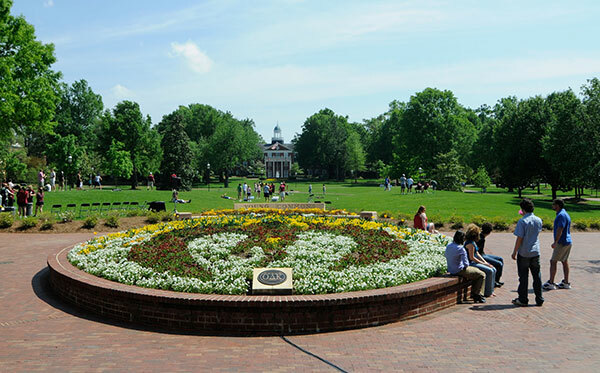 However, the beautiful plaza framed by oak trees and historic buildings soon became the location for Elon’s weekly College Coffee community gatherings and Commencement and New Student Convocation receptions. 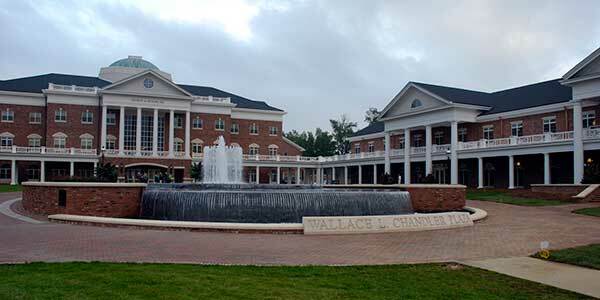 The Master of Business Administration program becomes Elon's first master's program. Five MBA degrees are awarded during the 1986 Commencement ceremony. The Martha and Spencer Love School of Business is established thanks to a $1million gift by the Martha and Spencer Love Foundation. The gift was the largest in in the 97-year history of the college. The school was named in honor of its benefactors for their impact in the business world and the region's economy through their company, Burlington Industries, which Spencer Love founded in Burlington, N.C., in the early 1920s. Undergraduate enrollment exceeds 3,000 students. Meanwhile, a new graduate program, the Master of Education, is launched. The 75,000-square-foot facility houses Elon's Performing Arts department and is specifically designed for teaching and performance. The centerpiece stage is McCrary Theatre, a large fully equipped theatre and concert hall. It also includes the Yeager Recital Hall and the 100-seat Black Box Theatre. 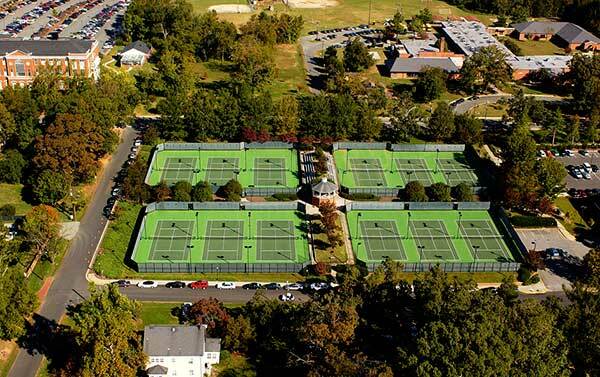 Jimmy Powell Tennis Center, a 12-court, championship tennis complex, opens and is recognized as one of the finest collegiate tennis complexes in the nation. 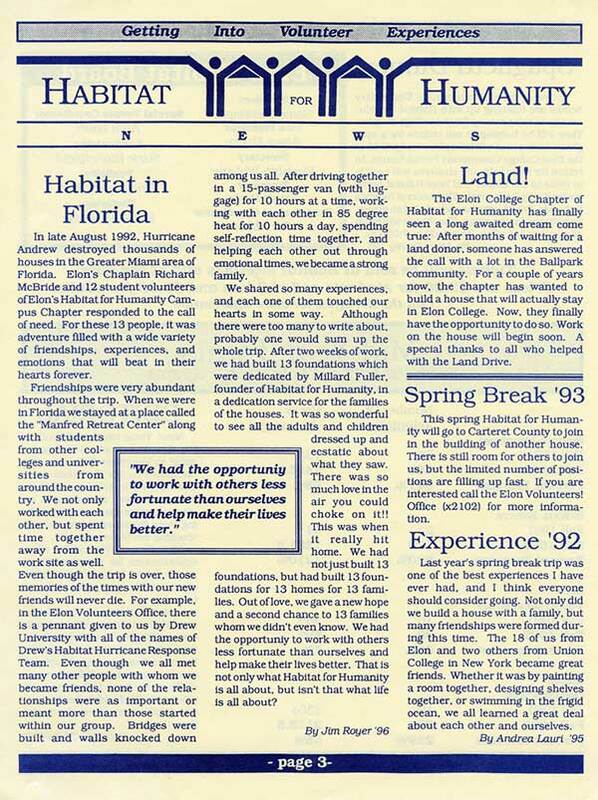 The Elon College Chapter of Habitat for Humanity received charter in September of 1988. 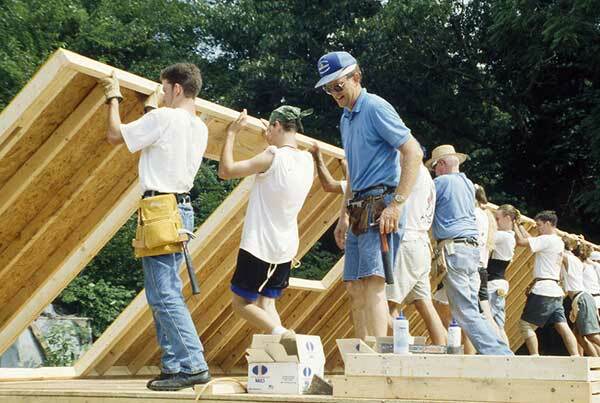 It was one of the first 30 chapters of Habitat for Humanity in the nation. The first major project was a complete renovation project finished in the fall of 1989. The first house constructed was completed in the fall of 1991. In 1989 Elon celebrated its centennial, taking pride in the 13,416 men and women who were awarded degrees in the first 100 years. A five-year plan leading up to the centennial included the Pride II fundraising campaign and many goals for improving academic and student life programs. 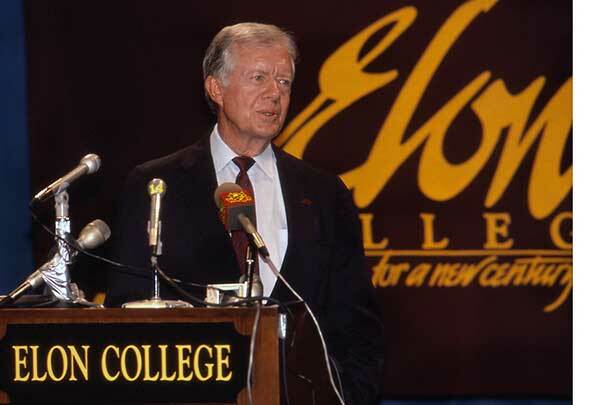 The Centennial year included a visit to campus by former President Jimmy Carter, a performance by jazz musician Dizzy Gillespie and presentations of Elon Medallions to President Emeritus J. Earl Danieley and legendary trustee Thad Eure. The 1889 cornerstone box was opened by President Young, who later sealed a new time capsule that is located behind the Elon Seal in Moseley Center. The Center for Service Learning is established. In 1997, the center is endowed as the John R. Kernodle Jr. Center for Service Learning. Elon's Investing In Excellence Campaign raises $21 million and the Elon Vision strategic plan, which transformed the campus with many new facilities, is launched. The goal of the new plan was to establish the college as a “premier undergraduate institution on the Eastern Seaboard.” The plan responded to a challenge from trustee chair Wallace Chandler ’49 to envision where Elon should be in 2000. The 17 objectives of the Elon Vision included construction of McMichael Science Center, Belk Library and Rhodes Stadium. Enrollment grew by almost 1,000 students in the 1990s and applications for admission nearly doubled. Also that year, the 4500-square-feet Stewart Fitness Center opens. 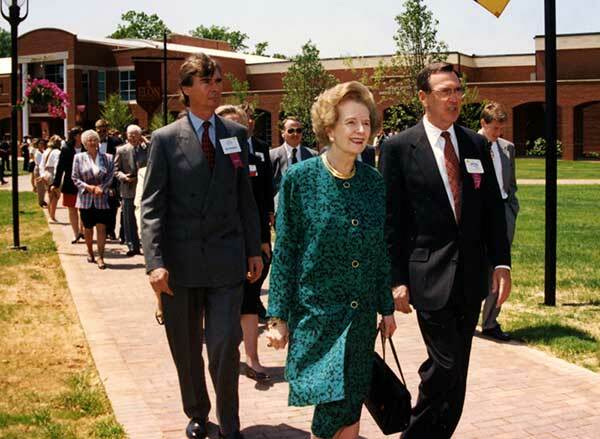 Former British Prime Minister Margaret Thatcher dedicates Moseley Center, Koury Center and the Center for the Arts. The Loy Center provides on-campus facilities for Greek organization. The Greek courtyard was named for Lib Apple Loy. 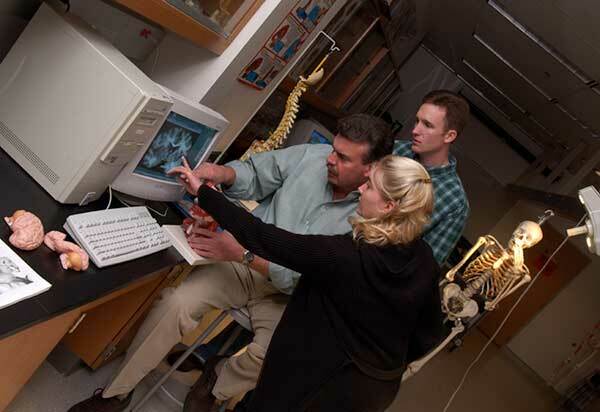 Programs initially housed in the science center include biology, physics, chemistry and the master of physical therapy, which was also established that year. The state-of-the-art facility is equipped with more than 70 computers, 27 high-tech instruments such as a nuclear magnetic resonance spectrometer and a scanning electron microscope. The building features 17 teaching labs, 14 student research labs, classrooms, faculty offices and 11 reading and conference rooms. Elon Athletics began competing in NCAA Division I in 1999. Also that year, the Danieley Center is dedicated. The center, which was named in honor of President Emeritus James Earl Danieley, includes a Commons Building that features a fireplace lounge, computer room and dining facility. 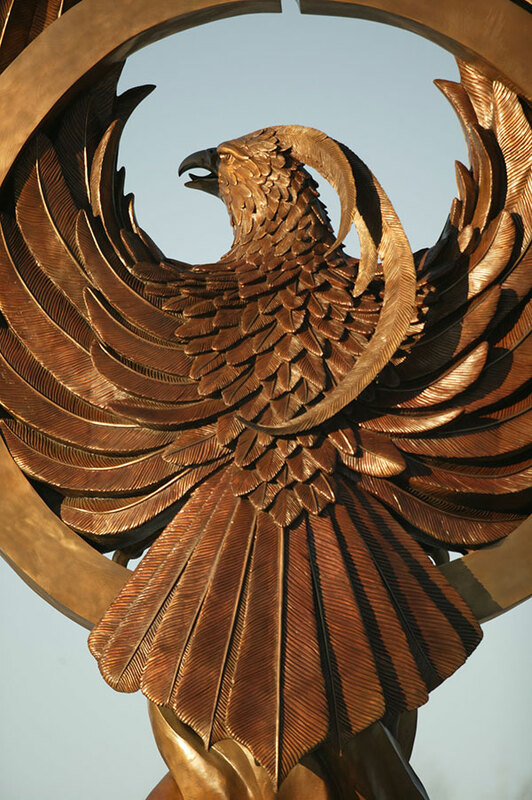 The Phoenix is adopted as the new athletics identity; Isabella Cannon '24 delivers the Commencement address at age 96, which is broadcasted on national television; Elon awards its 20,000th degree and Queen Noor of Jordan speaks at fall convocation. The Town of Elon College becomes Town of Elon, Rhodes Stadium opens and the Elon Vision campaign concludes, raising $46.7 million. Former President George Bush visits campus. Isabella Cannon International Studies Pavilion and William R. Kenan Jr. 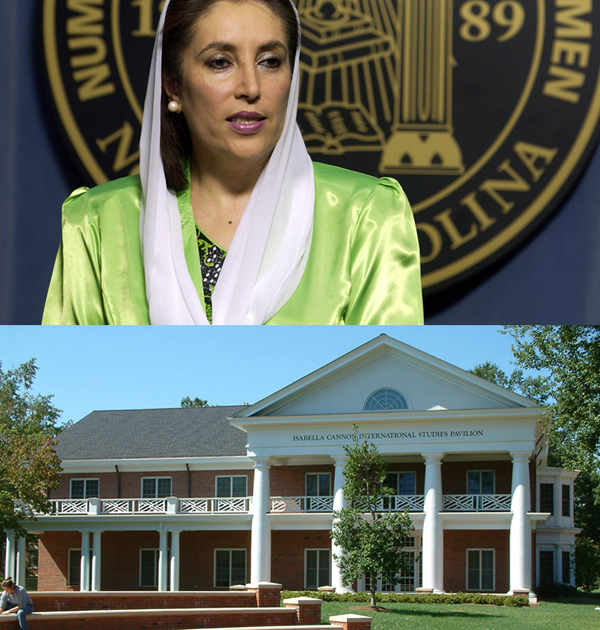 Honors Pavilion open in the Academic Village; primatologist Jane Goodall speaks at Spring Convocation; former prime minister of Pakistan Benazir Bhutto speaks at Fall Convocation; Belk Track and White Field are completed. Elon enrolls first class of Doctor of Physical Therapy students; broadcasting legend Walter Cronkite visits campus; Archbishop Desmond Tutu speaks at Spring Convocation. Martha and Spencer Love School of Business achieves AACSB International accreditation; former presidential adviser David Gergen serves as Elon's first Isabella Cannon Distinguished Visiting Professor of Leadership; Nobel Peace Prize winner Elie Wiesel speaks at Spring Convocation; Board of Trustees votes to establish Elon University School of Law in Greensboro, N.C.; Ella Darden and Elmon Lee Gray Pavilion opens in Academic Village. Pioneering astronaut John Glenn dedicates site of new Ernest A. Koury Sr. Business Center; Elon named one of nation's 25 "Hottest Colleges" by Newsweek-Kaplan; Doctor of Physical Therapy program graduates charter class; construction begins on School of Law facility in Greensboro. 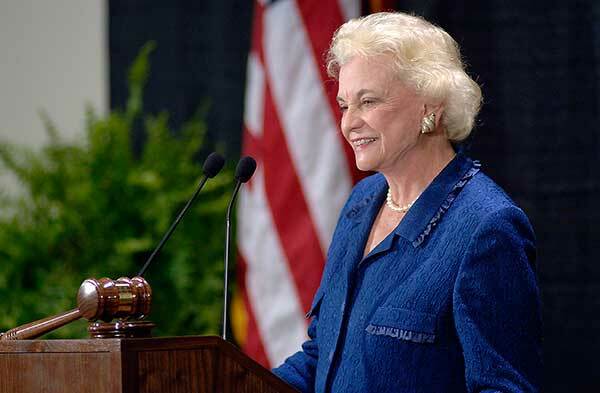 Elon University School of Law opens in downtown Greensboro, N.C. with a charter class of 115 students; the school is formally dedicated by former U.S. Supreme Court Justice Sandra Day O'Connor. The need for the school and its location in downtown Greensboro, N.C., was based on a study of a feasibility committee. Many Triad businesses, foundations and individuals provided funding, with the Joseph M. Bryan Foundation purchasing the former Greensboro Public Library building to house the school. The school received full American Bar Association accreditation at the earliest possible date in 2011. Since its founding, Elon Law has expanded its Greensboro campus and the reputation of the school continues to grow. The Ernest A. Koury Sr. Business Center also opens. 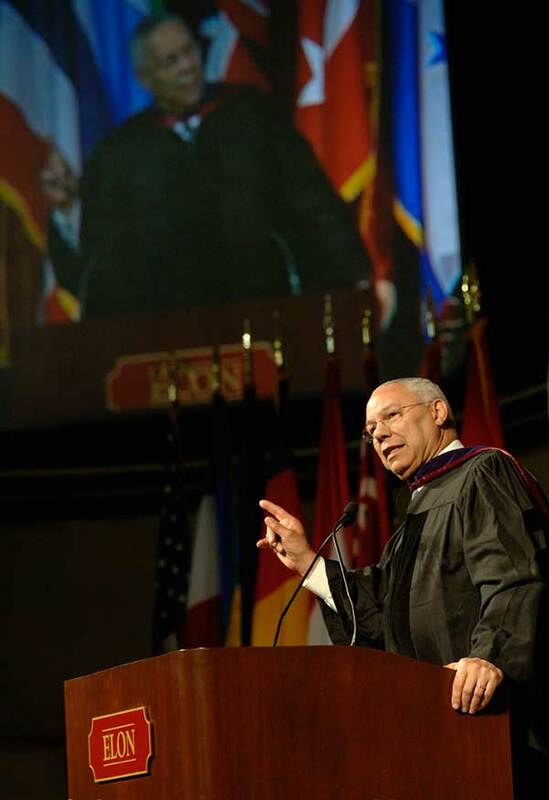 Former U.S. Secretary of State Colin Powell delivers Convocation for Honors address; The Oaks, a student residence complex, opens; School of Communications achieves ACEJMC accreditation; Elon named one of nation's top three universities for community service in President Bush's inaugural Higher Education Service Honor Roll; total enrollment exceeds 5,000 for the first time. 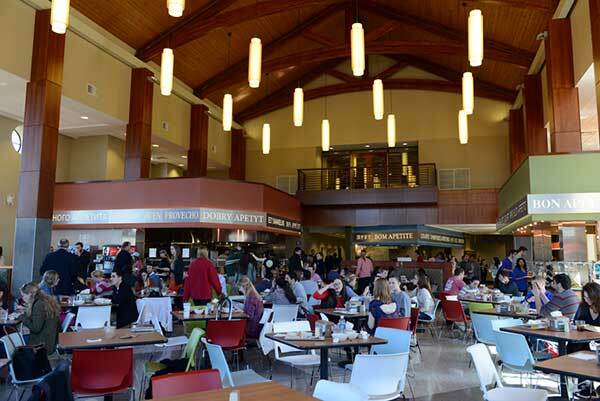 The Colonnades Dining Hall and the Colonnades Residence Halls A & B open and William Henry Belk Pavilion and Luvene Holmes and Royall H. Spence Jr. Pavilion open in the Academic Village. Also, the Elon Academy, an outreach program for Alamance County high school students, is launched and the Lumen Prize is established as the university's premier award recognizing student scholarship. Former President Bill Clinton speaks on campus on behalf of his wife, Hillary Rodham Clinton, who is running for president. Elon University School of Law receives provisional approval by the American Bar Association; Breanna Detwiler becomes the first Elon student to receive the prestigious Truman Scholarship. 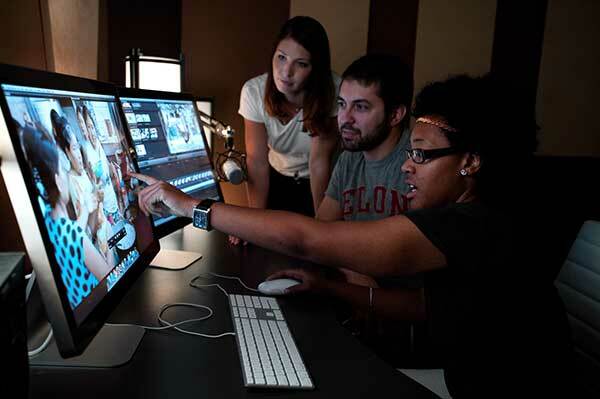 In 2009, the School of Communications launches a master's program in interactive media; also, Elon University School of Law graduates its charter class. Elon trustees approve the addition of a master's program in physician assistant studies and the establishment of the 56-acre Elon University Forest. 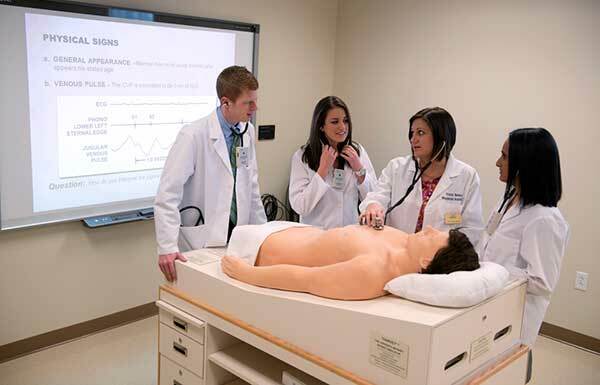 The inaugural class of the master's program in physician assistant studies enrolls in 2013. Also in 2010, a full renovation of Alumni Gym is completed, including the newly-named Robertson Court. Alumni Field House opens at Rhodes Stadium, the new headquarters of Phoenix athletics; Elon trustees approve establishment of a School of Health Sciences; the Colonnades Residential Neighborhood is completed, including three new residence halls, Harper Hall, Staley Hall and Kivette Hall, along with Elon's first geothermal energy system; five new Greek Life houses open in Loy Center. The Ever Elon campaign concludes in December, raising a record $107.3 million. The Gerald L. Francis Center opened as the home of Elon's School of Health Sciences; The Station at Mill Point, a townhouse residential neighborhood for juniors and seniors, opened on Williamson Avenue; the undergraduate program of the Martha and Spencer Love School of Business was ranked among the nation's best by Bloomberg Businessweek; the Student Professional Development Center opened in Moseley Center; trustees approved the addition of women's lacrosse as a new NCAA Division I sport. In fall 2013, Elon opened the first two buildings in the Global Neighborhood, an international-themed residential area adjacent to the new Lakeside Dining Hall that is part of the university’s $100 million plan to transform the residential campus. The seven campus neighborhoods also include the Station at Mill Point (2012), the Colonnades (2007 & 2011), the Oaks (2006), Danieley Center, the Historic Neighborhood and Loy Center. The plan is designed to increase the percentage of students who live on campus and integrate academics, living-learning communities and co-curricular activities to meet students’ needs at each stage of their college careers. In February 1900, two Elon students petitioned to play a game against Guilford College. Their request was granted, and the team traveled to Guilford on March 23. The Quakers overwhelmed the Fighting Christians, 32-3. The teams played a second game on April 24 on Elon's campus, but again Guilford easily dispatched Elon, 38-3. On Nov. 5, dedication ceremonies were held for the completed William S. Long Student Center and three men's dormitories, Hook, Brannock and Barney Halls, named in honor of veteran faculty members Alonzo Hook, Ned Brannock and John Barney. In 1963 Paul deMontaigne of Martinique became Elon’s first black student; President J. Earl Danieley personally escorted him to his first class in the evening program. The next semester, Glenda Phillips became the first fulltime black student, and in 1969 Eugene Perry became the first black student to graduate. 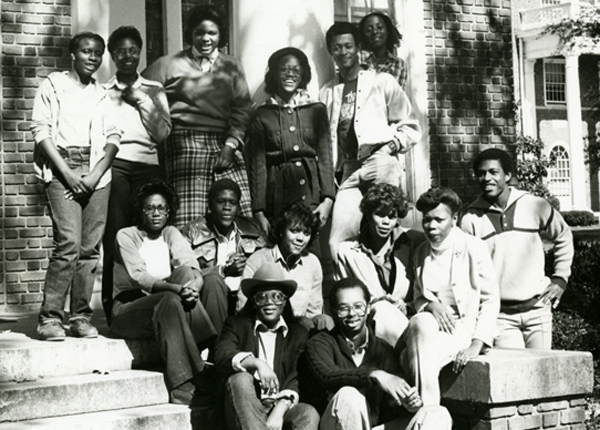 Wilhelmina Boyd became the first full-time black faculty member in 1987. The Office of Multicultural Affairs was created in 1993, El Centro de Español opened in 1998, and the Gender and LGBTQIA Center opened in 2013. 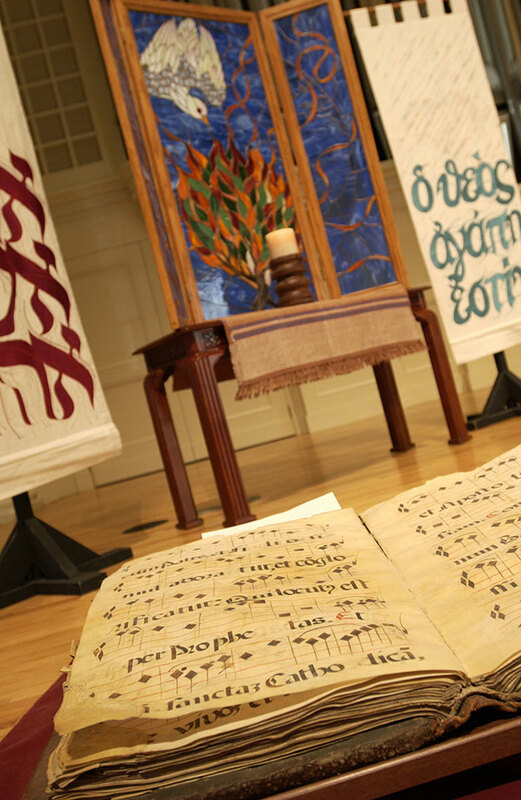 Religious diversity expanded with the establishment of Elon Hillel in 1994, the Catholic Newman Center in 2009 and the opening of the Numen Lumen Pavilion, a multi-faith center, in 2013. 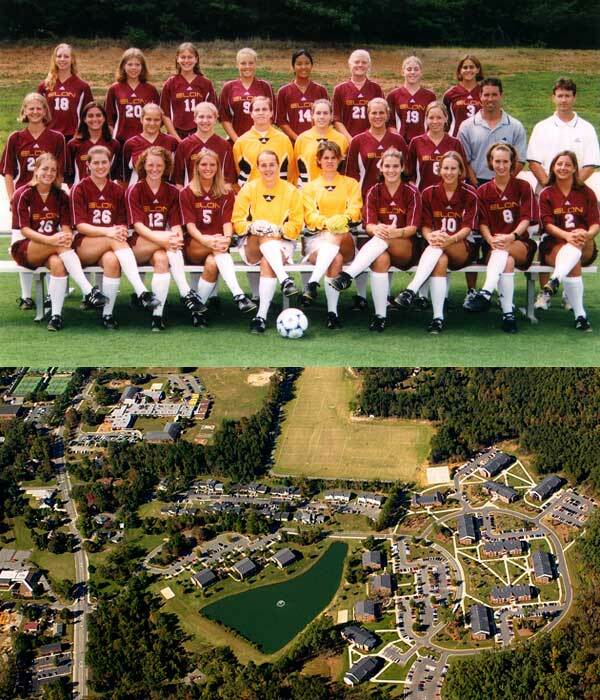 In 2003 Elon purchased 73 acres of the Elon Homes for Children property, including Johnston Hall, Holt Chapel and Truitt Building. The acquisition exemplified the historic partnership between the university and the organization founded as the Christian Orphanage by the Southern Christian Convention. Orphanage superintendents included Elon trustee Charles Johnston and alumni John G. Truitt ’17 and Walstein Snyder ’45. The Elon Homes property was named South Campus, including Phoenix Club Sports Fields. The university purchased the remaining Elon Homes property in 2012, including facilities that will serve the needs of the university’s academic and student life programs. 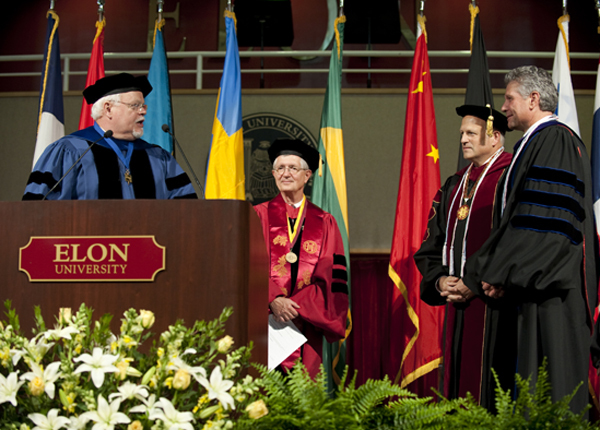 In April 2010 the Phi Beta Kappa Society granted a charter to its 57 Elon faculty and staff members, formally establishing a chapter at the university. The nation’s oldest and most prestigious academic honor society acknowledged Elon’s extensive progress in enhancing its arts and sciences programs. Forty-seven students were inducted into the chapter’s inaugural class. As part of a day-long celebration, Elon dedicated Phi Beta Kappa Commons in the center of the Academic Village, a seven-building quadrangle developed from 2002 to 2013. Lindner Hall, the anchor building in the quad, is the headquarters for Elon College, the College of Arts and Sciences.